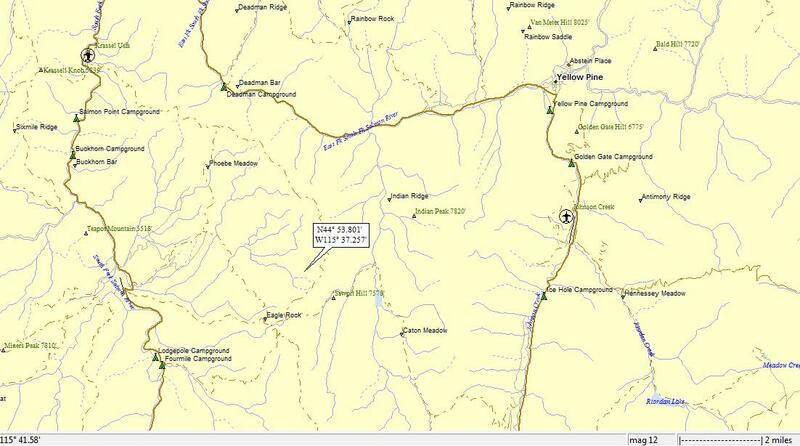 I landed in the watershed of a new river, the S Fk of the Salmon R; on to the Salmon (12th hit); to the Snake (66th hit); to the Columbia (131st hit). 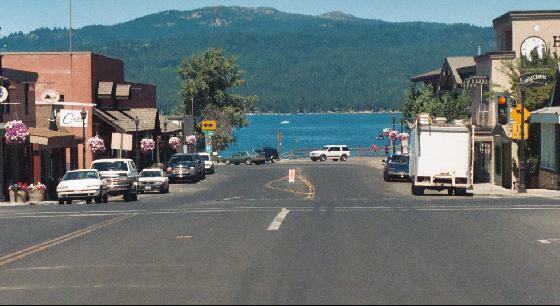 I toyed with featuring McCall, a fairly sizable (pop about 2000) touristy town on the shores of Payette Lake. It’s a lovely area. But I couldn’t find that hook that I’m always looking for. 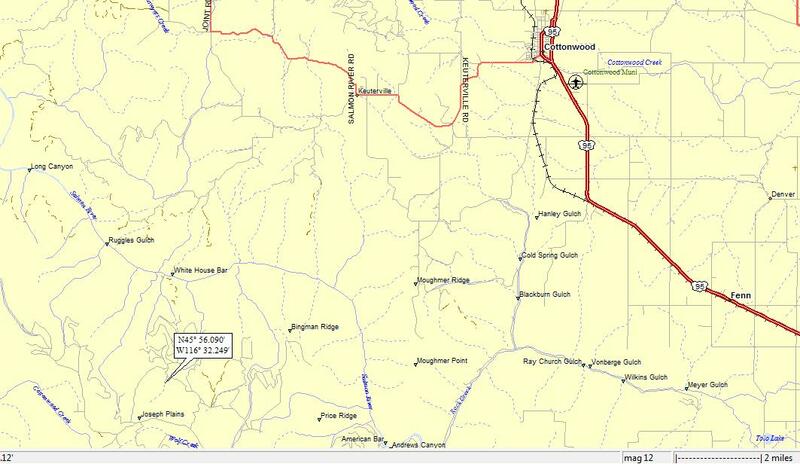 But I stumbled on some interesting information about Roseberry, which has caused me to break with one of my time-honored traditions: I feature towns that are shown in bold-faced type on my map, like Yellow Pine, McCall, Lardo and Donnelly. But Roseberry? 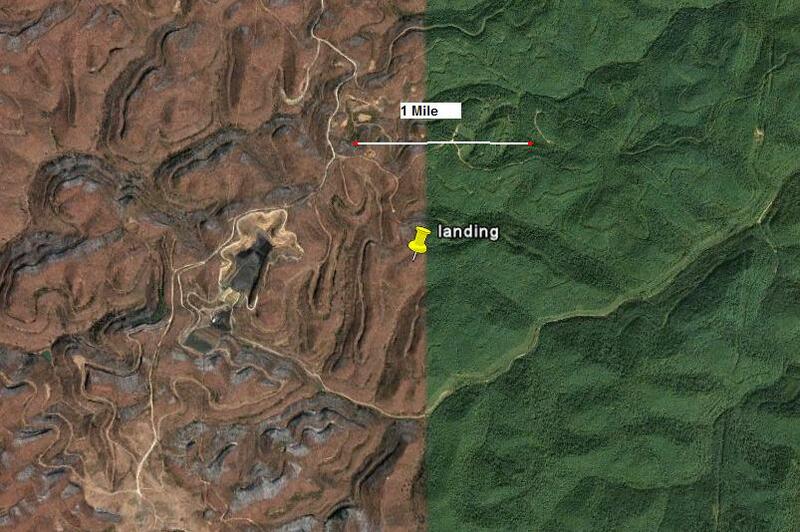 There it is, on my landing map, in meek typeface just east of Donnelly. 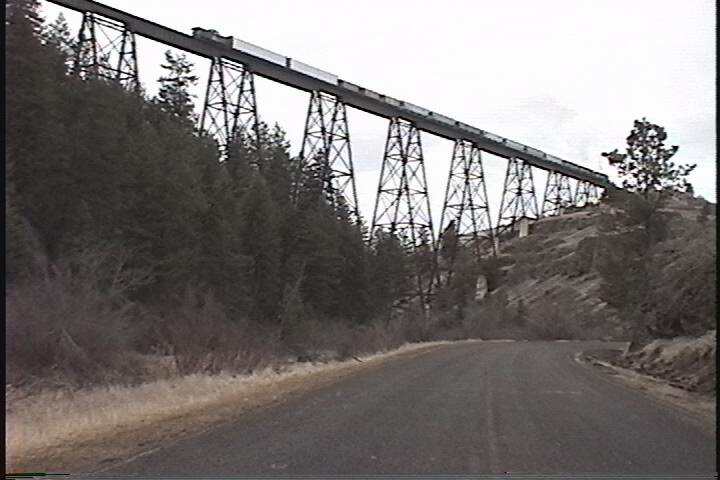 Roseberry, Idaho, is a town that used to be a town but isn’t any more because the railroad went a different direction [it went through Donnelly]. 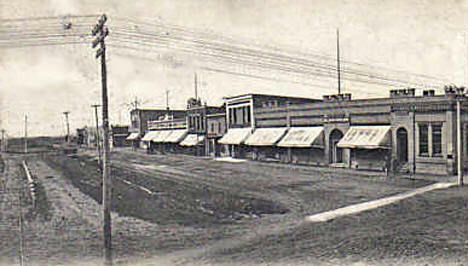 Roseberry, founded by Finns, used to be the biggest town in the Long Valley region of Idaho. Now it’s mostly a memory … and a major project of Frank and Kathy Eld. Frank has been working for 39 years to rebuild (focusing on the town’s Finnish heritage), to restore, and revitalize Roseberry, ever since he graduated from college. 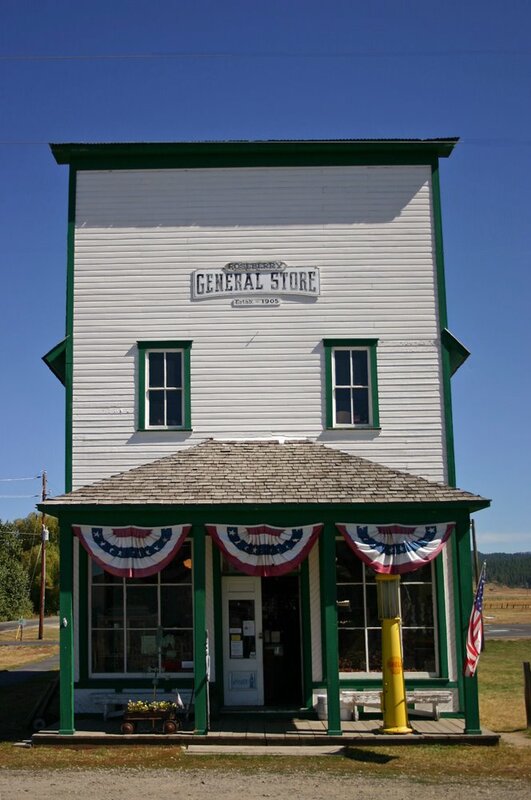 Kathy operates the Roseberry General Store and Museum while Frank rebuilds. 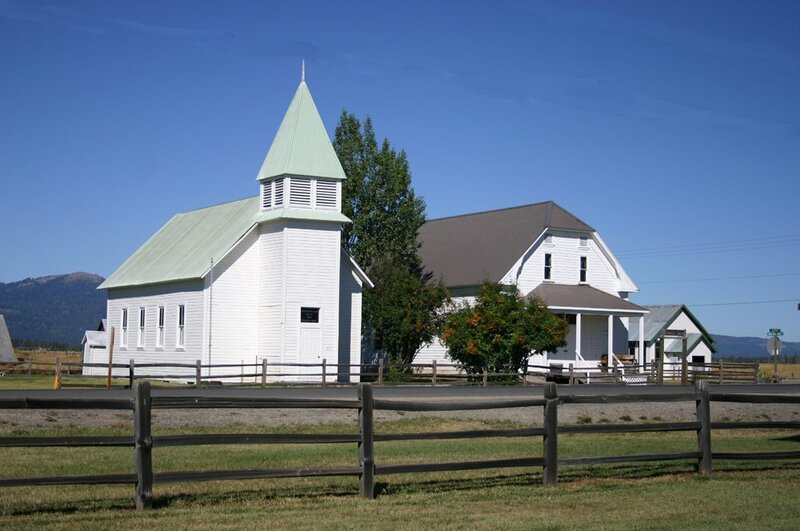 Roseberry, Idaho is an old Finnish settlement near Donnelly, Idaho. The Finns settled here in the late 19th century after fleeing the oppressive Russian empire who occupied Finland at the time. 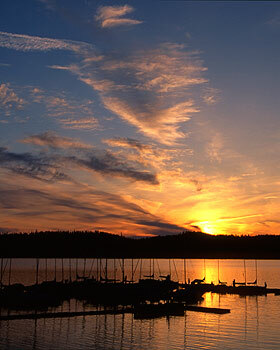 It is a source of local pride and a part of Idaho history and of who settled it. The Finns had fled Russian-dominated Finland in the late 19th century because the czarist government wanted to eliminate the Finnish way of life and make Finland a part of Russia. The Finns fled to the United States and settled in Idaho because Idaho reminded the Finns of home with its mountains and open fields that were suitable for their agricultural way of life. 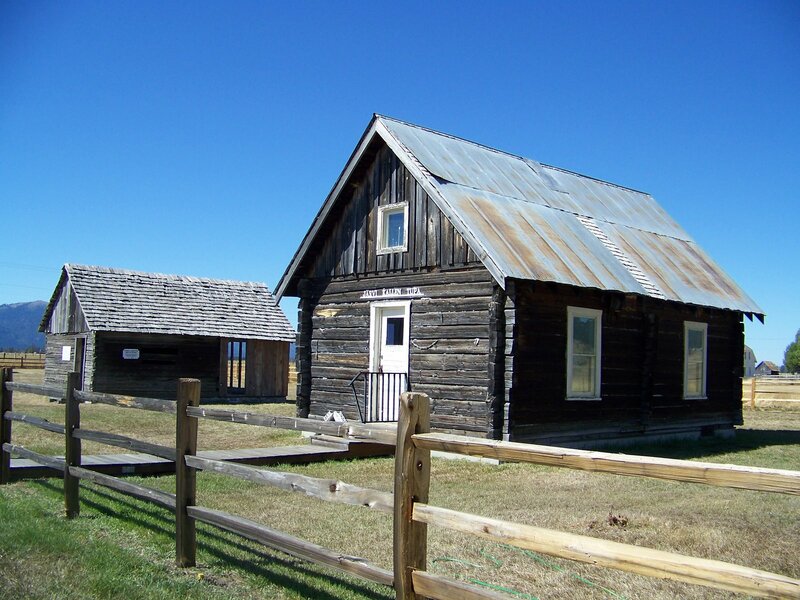 Today, there are only a few houses left from the original settlement at Roseberry, and they are preserved as an outdoor museum for people to see the Finnish way of life in Idaho in the 19th century. 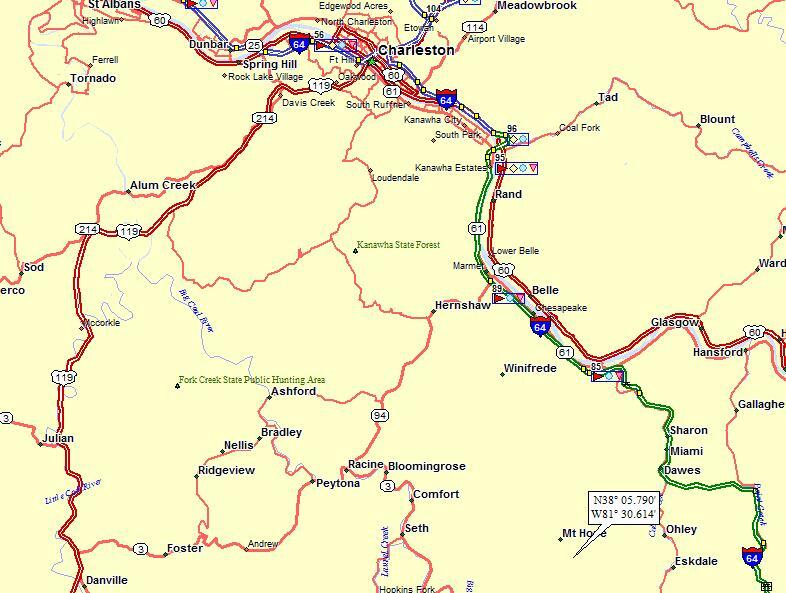 I landed in the watershed of a new river, the Pond Fk of the Little Coal; on to the Little Coal (2nd hit); on to the Coal (also 2nd hit); on to the Kanawha (11th hit); on to the Ohio (118th hit); on to the MM (732nd hit). 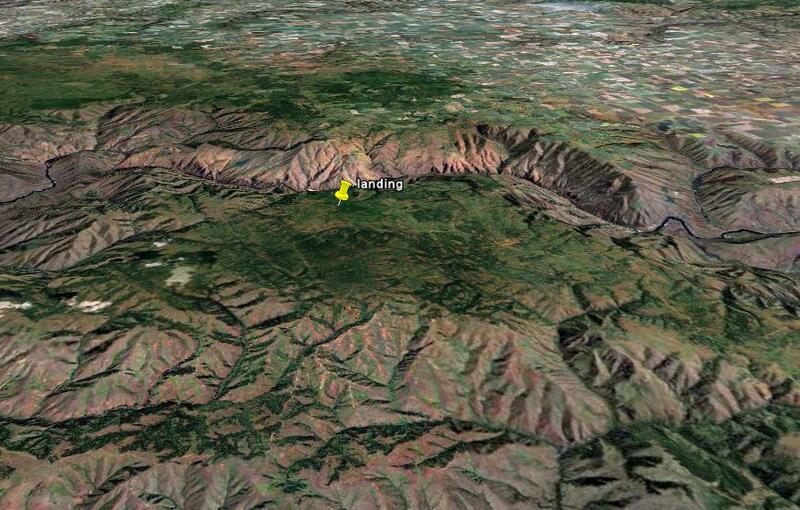 Here’s an oblique GE shot, looking east towards one of the mines. 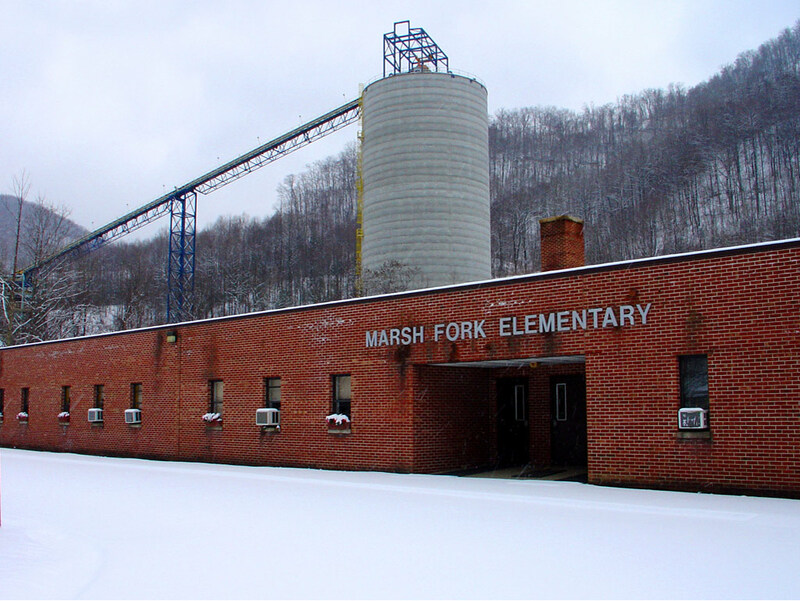 The Marsh Fork Elementary School in Sundial, West Virginia is located 400 yards downslope from a mountaintop removal mine. 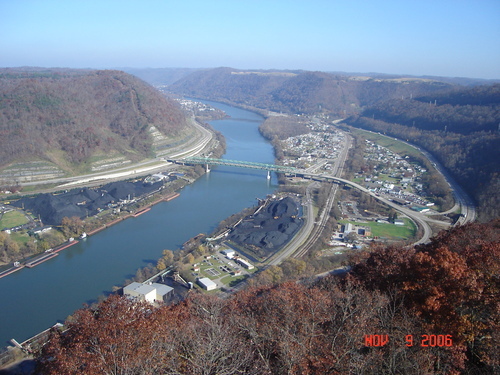 The mining site above the school, operated by Massey Energy, houses the Shumate sludge impoundment. 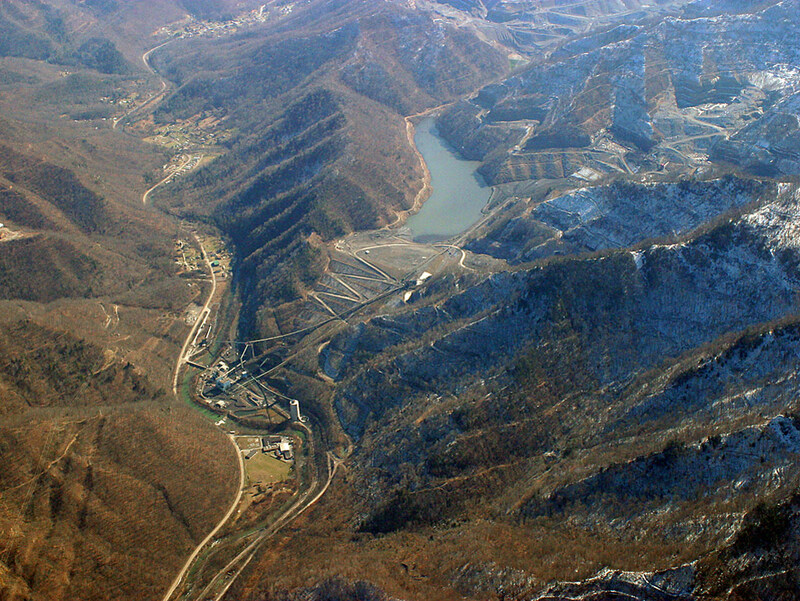 With 2.8 billion gallons of coal sludge (also known as coal slurry) held back by a 385-foot-high earthen dam, it is one of West Virginia’s largest impoundments. 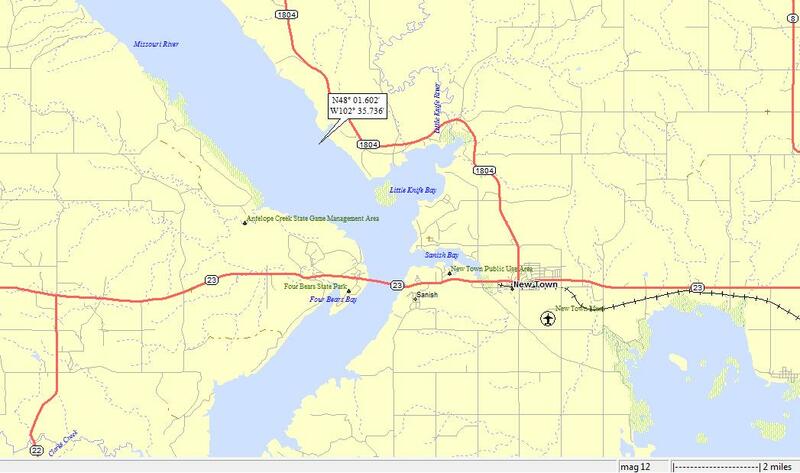 The two photos below are of Marsh Fork Elementary School, and the 2.8 billion gallon coal sludge impoundment directly uphill from the school. Coal slurry consists of solid and liquid waste and is a by-product of the coal mining and preparation processes. It is a fine coal refuse and water. Mining generates enormous amounts of solid waste in the form of rocks and dirt. 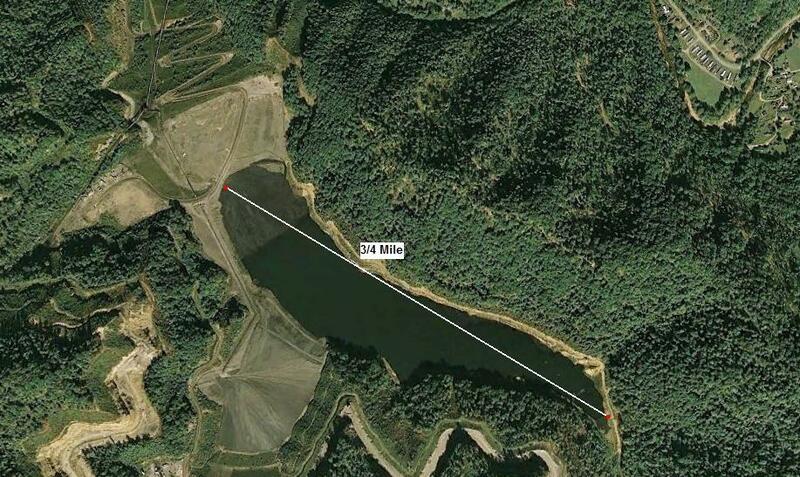 This refuse is used to dam the opening of a hollow between adjacent mountains. After the dam is built, the void behind it is typically filled with millions of gallons of waste slurry from a coal preparation plant. This impounded liquid waste can sometimes total billions of gallons in a single facility. 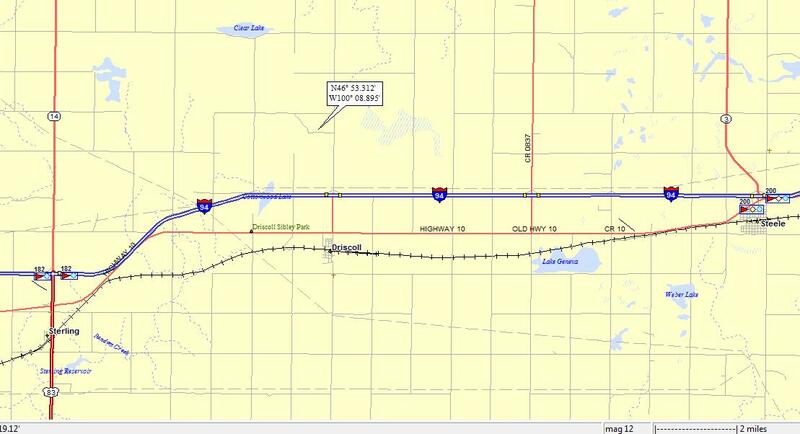 That said, I don’t blame the locals for being nervous about having one of these huge impoundments right above a community (and a school). For me, the immediate threat is less a chemical threat than a physical threat (if the dam gave way). 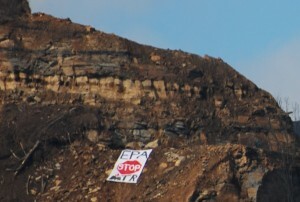 SUNDIAL, W.Va. – Three activists, who are committed to nonviolently ending mountaintop removal, unveiled a banner that said “EPA stop MTR” at Massey Energy’s Edwight mountaintop removal mine. Five people were arrested: the three activists Charles Suggs, Madeline Gardner, and William Wickham, and independent photographer Antrim Caskey and independent filmmaker Jordan Freeman. 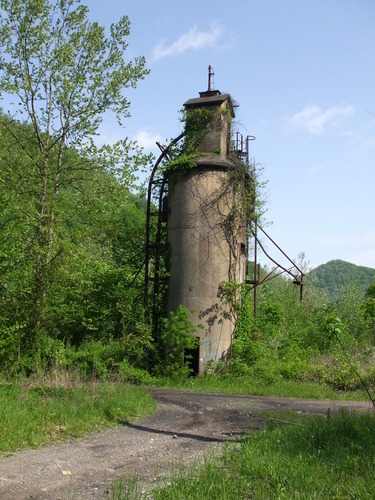 The activists chose the Edwight mine because Massey has recently begun blasting directly above the town of Naoma, W.Va., and the grave danger its slurry dam poses to Marsh Fork Elementary. 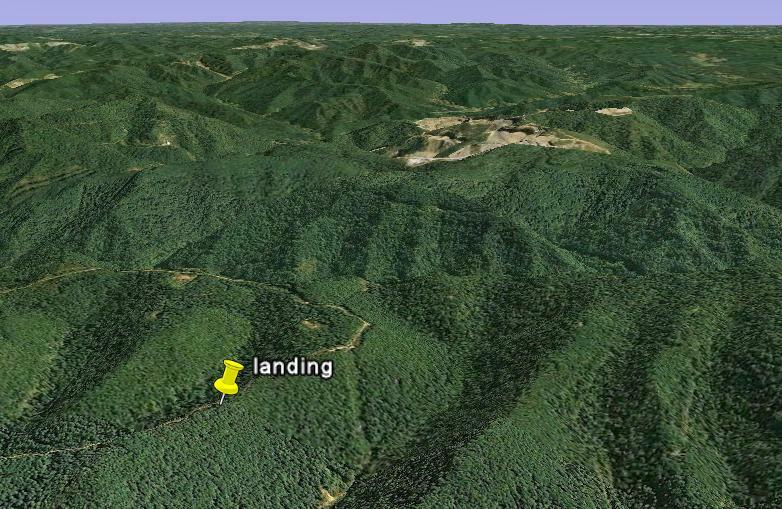 This is the fifth in a series of such actions over the last 3 months that Climate Ground Zero has taken against Massey Energy and mountaintop removal coal mining. 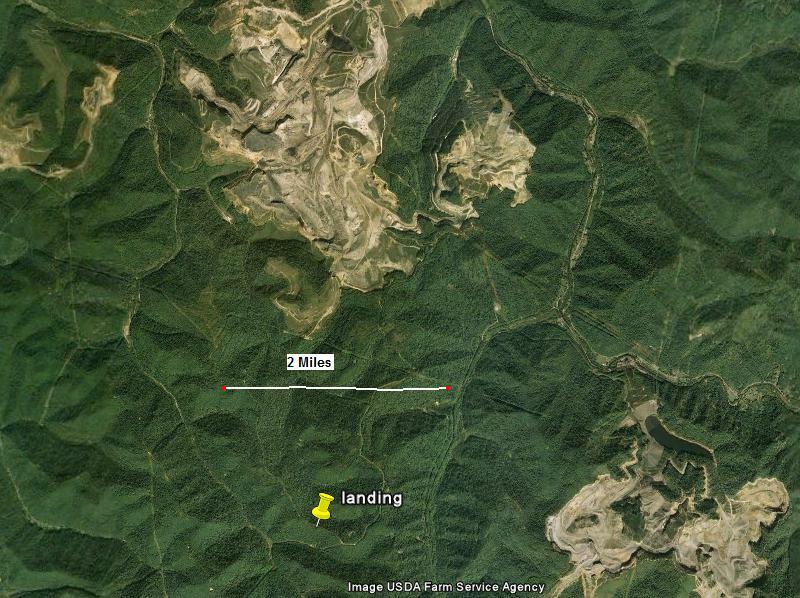 Perhaps most unfortunate for the communities around Sundial is that Massey energy intends to vastly expand the mountaintop removal operation up-slope from the town and school. 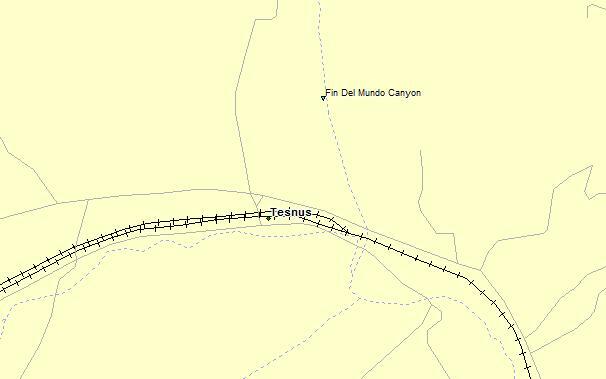 What’s more, permits for extensive future MTR operations have been issued throughout the region. 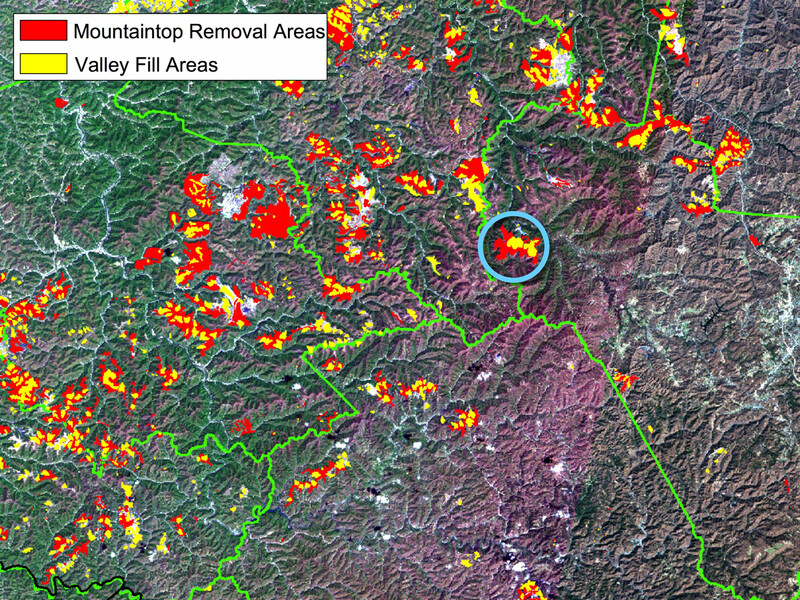 The image below show the permitted mountaintop removal areas (with the Massey mine circled). Wow. 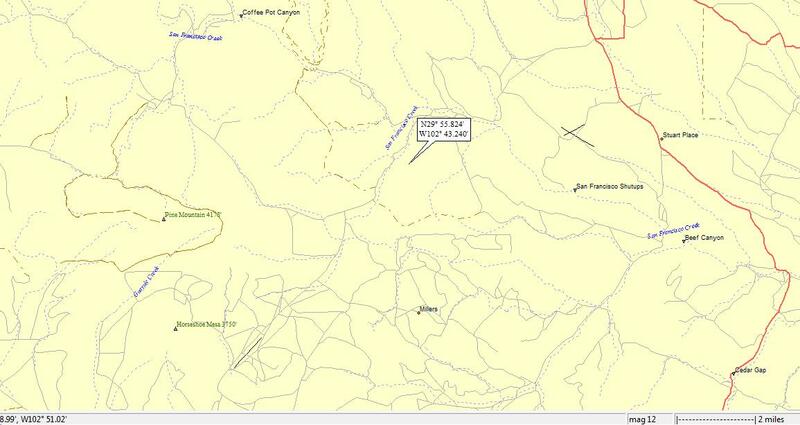 That’s a lot of mining planned for this part of WV. I’m sure there are many voices that speak out regularly on both sides of the coal mining issues . . . The deep valley you see in the forground is that of the Salmon R (11th hit); on to the Snake (65th hit); on to the Columbia (130th hit). 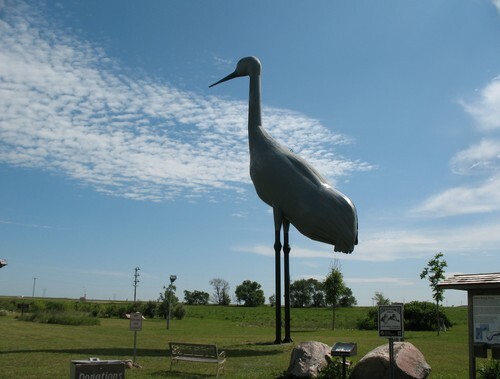 In Cottonwood, a small town in Idaho, a giant dog stands at a crossroads. 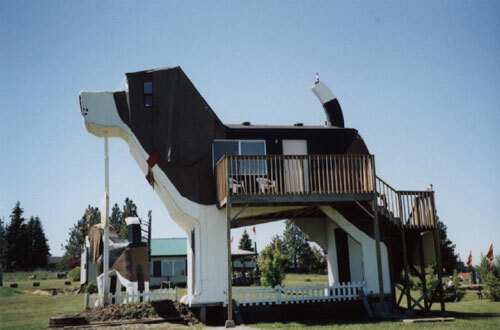 Standing at 10m high, “Sweet Willie” is the largest beagle in the world and the exterior of the Dog Bark Park Inn. Willie is unlike anything you’ll have ever seen before: inside his belly there is a double bed, small kitchenette and dining area with a view out of his eyes, whilst the bathroom is housed in his rear. The unusual furnishings – such as bedside mutt mat, carved doggie bed head and “Dog-opoly” – mean that those without a sense of fun may want to skip this hotel. Gertrude was born January 6, 1256, in Eisleben, Thuringia (within the Holy Roman Empire, a Germanic “State”). Nothing is known of her parents, so she was probably an orphan. As a young girl, she joined the Benedictine monastery in Helfta, under the direction of its abbess, Gertrude of Hackeborn. She dedicated herself to her studies, becoming an expert in literature and philosophy. She later experienced a conversion to God and began to strive for perfection in her religious life. She had various mystical experiences, including a vision of Jesus, who invited her to rest her head on his breast to hear the beating of his heart. 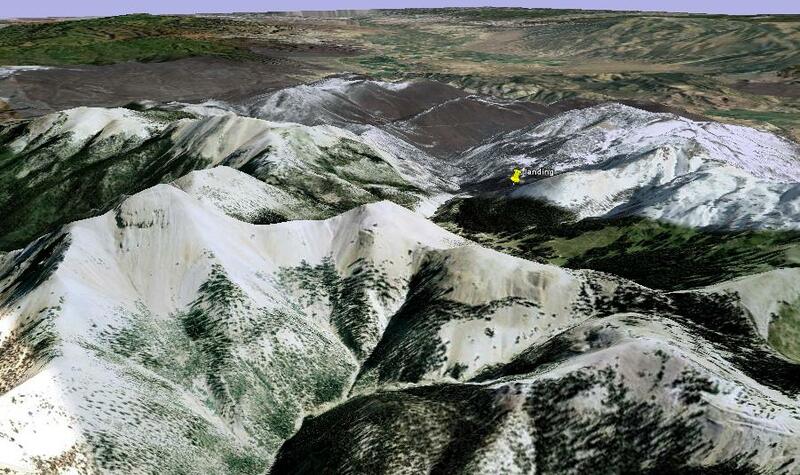 This canyon along Lawyers Creek in the middle of the Camas Prairie was named for a Nez Perce Indian. Hallalhotsoot was nicknamed Lawyer by area mountain men because of his shrewd mind and combative nature. 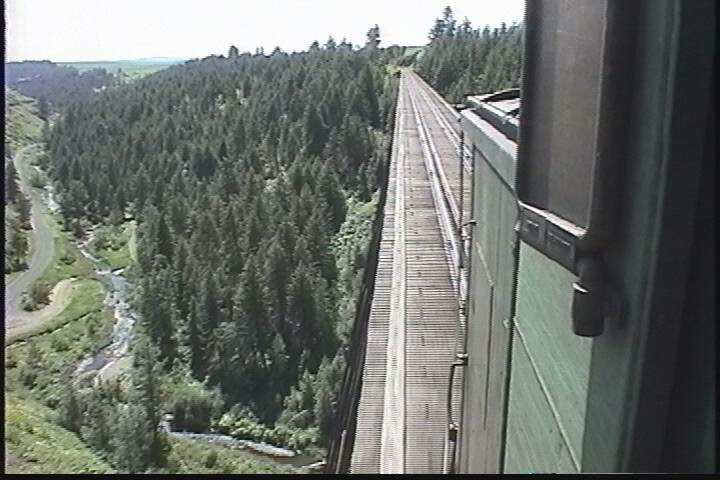 I’ll bet a right of passage for local teenage boys is to cross this trestle on foot . 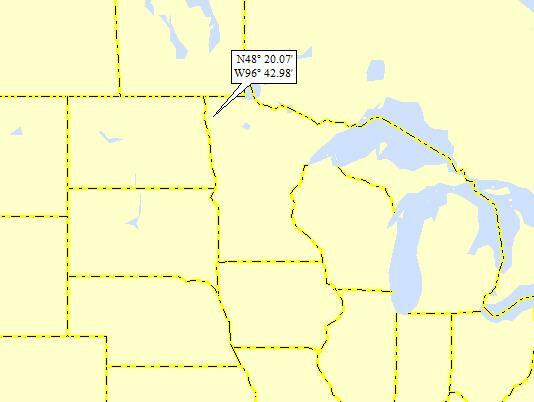 . .
Dan – Enough with the upper Midwest already! After ND and MN comes another . . . ND; 53/43; 4/10; 2; 153.0. 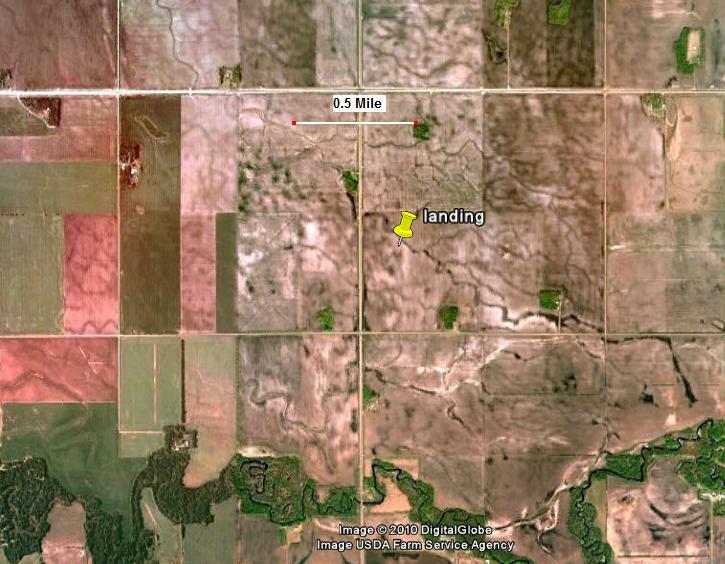 Here’s my landing map, showing my proximity to Driscoll, Steele & Sterling. It turns out that Driscoll & Sterling are pretty much GD; thus this post features Steele. 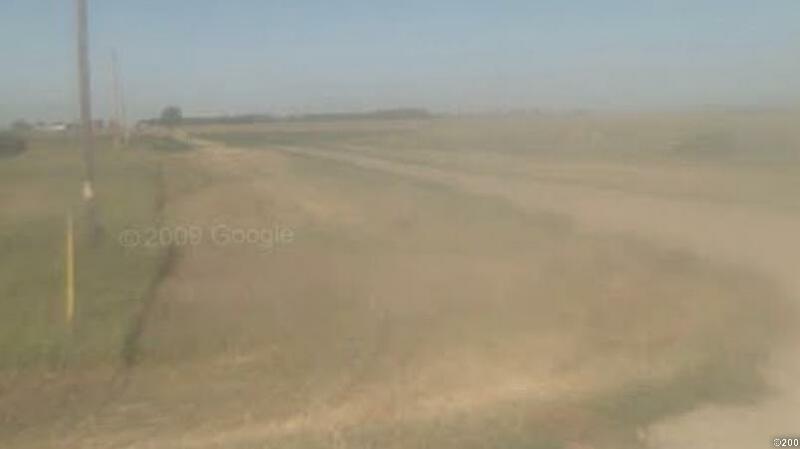 Here’s my GE shot, showing that I landed in a vague-looking field. 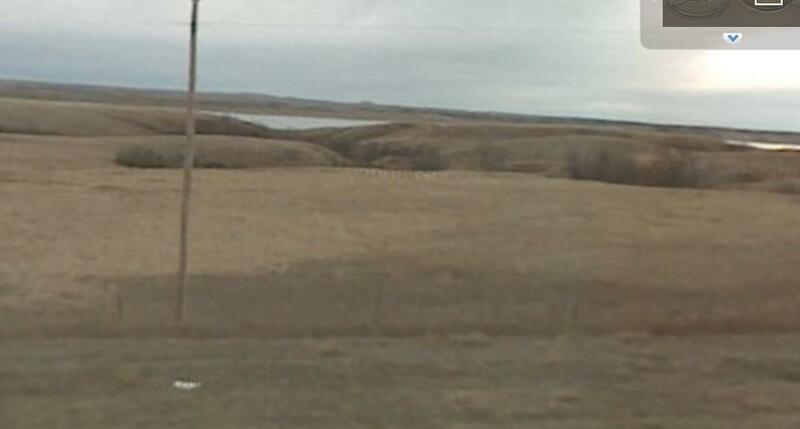 It might be pasture, or it might be more-or-less open prairie land. Anyway, here’s a GE Street View shot. 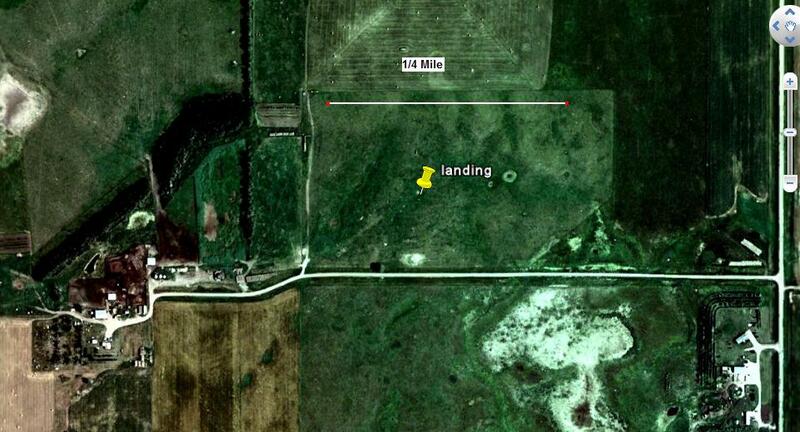 My landing is toward the distance, to the right of the dirt road you can see. As you can see, none of the streams connect to one another! I surmised that water that landed on my landing spot would end up in Random Ck, but you’ll note that Random Ck just stops! 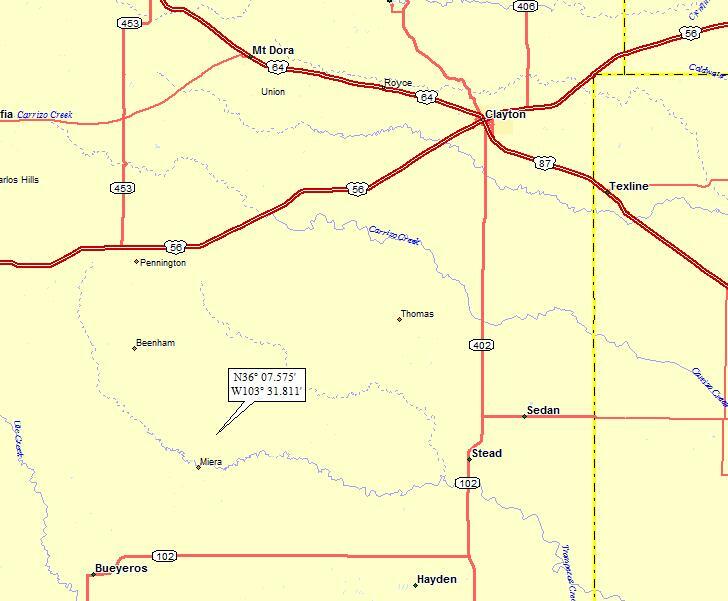 When I’m in a desert area, and a stream stops out in the middle of nowhere, I conclude that it’s “internally-drained.” But here, in relatively wet central ND, there’s a different story. I landed in a “sand hills” region, where the soils are so sandy that streams form, but then the water sinks into the sands, becoming groundwater. The groundwater then continues to flow (very slowly) through the sand, but continuing downhill. At some point, the groundwater comes back to the surface (as springs, or discharging into a lake or pond), and continues its merry way. 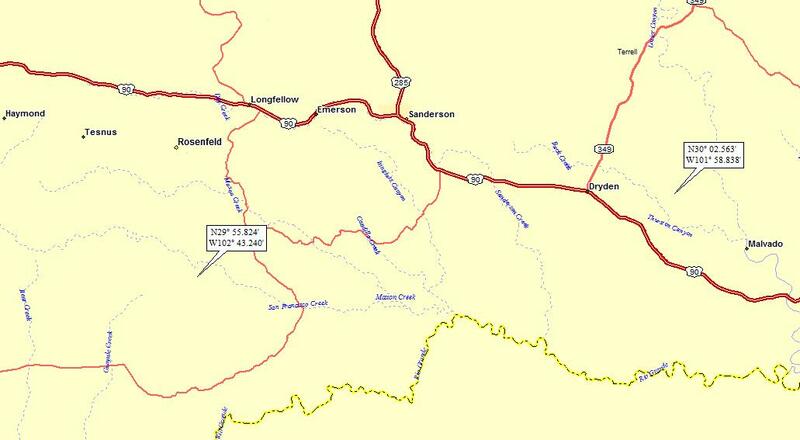 So anyway, I figure that the water from Random Ck flows northwest into the series of little lakes you can see and ends up as groundwater that surfaces in the east-to-west flowing stream (Long Lake Creek) that then flows into the more substantial north-south flowing stream (Apple Creek) at the western edge of the map. 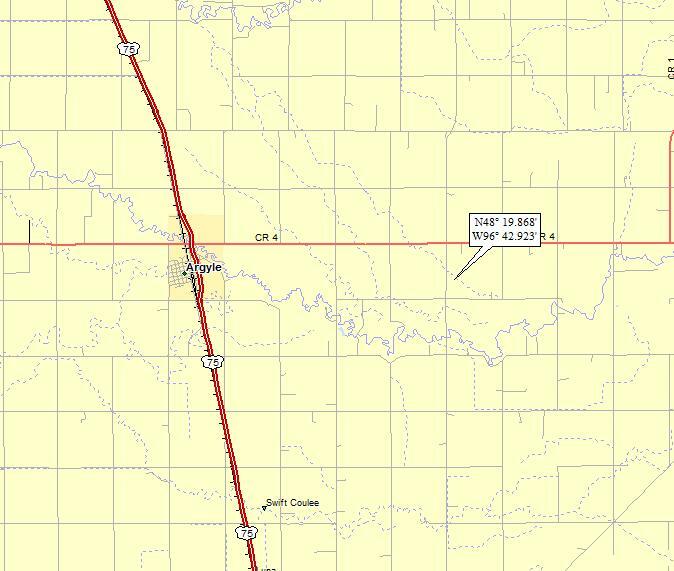 Apple Ck keeps its act together and flows into the Missouri R (342nd hit); on to the MM (731st hit). 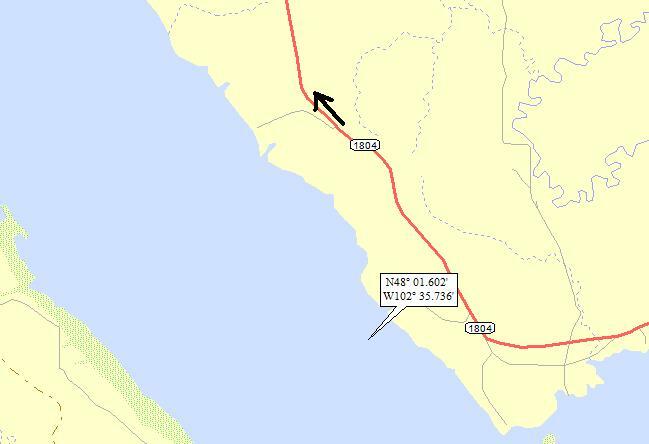 In 1864, the Northern Pacific Railroad Company was granted land (including Steele’s location) to aid in the construction of railroads. Wilbur F. Steele purchased that land from the railroad in 1878 and plotted the community of Steele. Mr. Steele had hoped that the state capitol would be located in Steele, so he erected a three-story building to house the legislature. 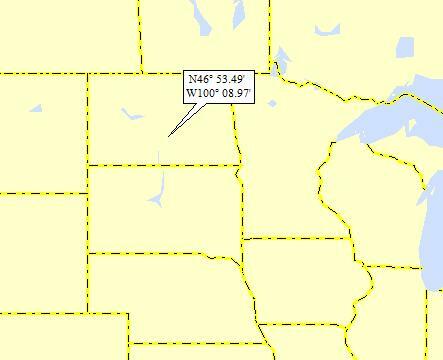 Political maneuvering and prestige of the politicians won out for location in Bismarck. 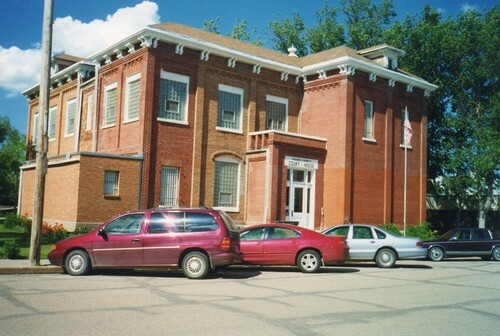 Mr. Steele sold the brick building to Kidder County on April 21, 1885, for $20,000, to be used as the courthouse. That building is the present Kidder County Courthouse.
. . . From then on, the chase was boring, as the storms in ND moving northeastward were not even remotely likely to be tornadic, and the cap held over the rest of the area we chased. We did see some nearby lightning strikes as we were driving in the rain, but that was about it for excitement. Took time for a “photo op” at sunset, north of Steele, ND. 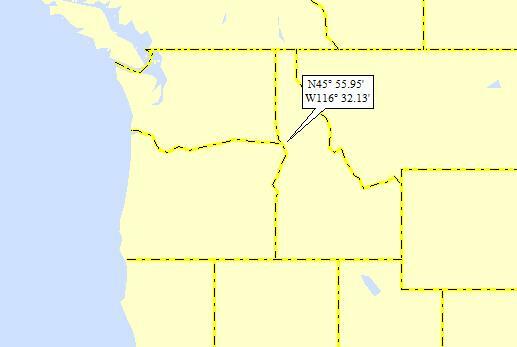 His log includes a wild story about being picked up for an illegal US-Canada border crossing. Click here (and scroll down to June 25th) for the story . 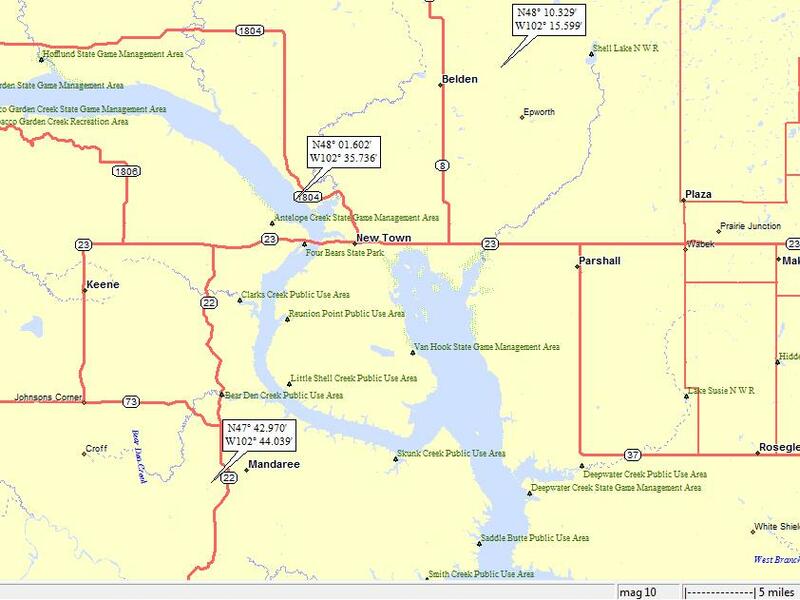 . .
For the second time, I landed in the Tamarac R watershed; on to the Red Lake R (9th hit); on to the Red R of the North (39th hit); on to the Nelson R (56th hit); on to Hudson’s Bay. Here’s a GE Street View shot from the N-S road just west of my landing. 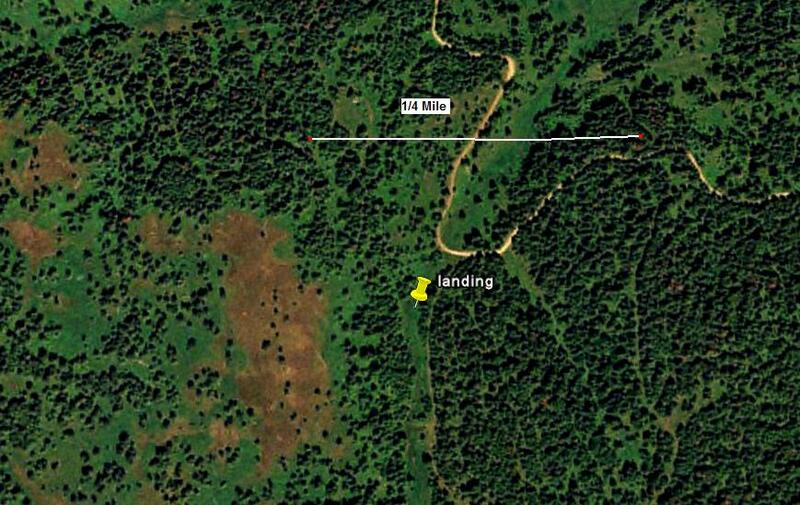 This shot is looking southeast towards my landing from where the unnamed tributary that’s right next to my landing (the dark squiggly line on the photo) crosses under the road. So my landing is in the distance in front of the trees. 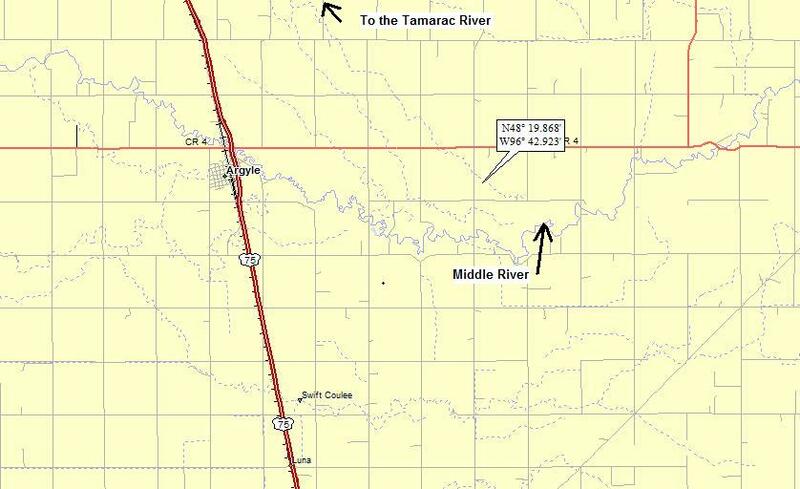 The river I landed very close to is the Middle, not the Tamarac. 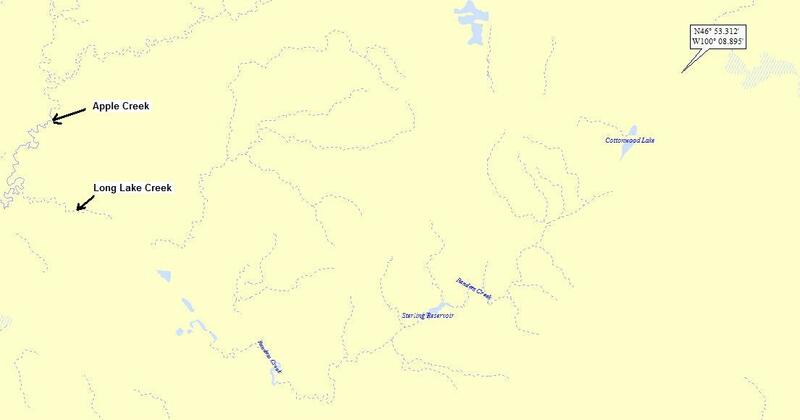 You see that the unnamed tributary mentioned above (that I landed next to) flows north to the Tamarac, not south (as would be expected) to the Middle! 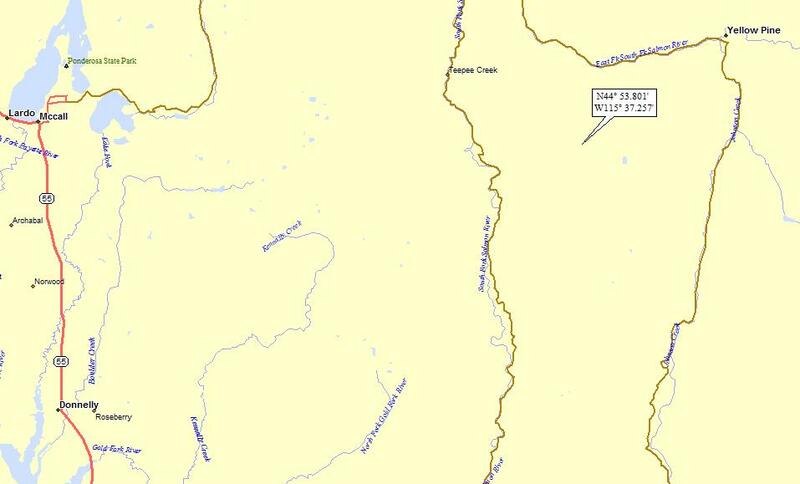 Here’s another GE shot, that shows (in the oval) that the headwaters of the unnamed tributary are remarkably close to the Middle River (about 500 feet away). 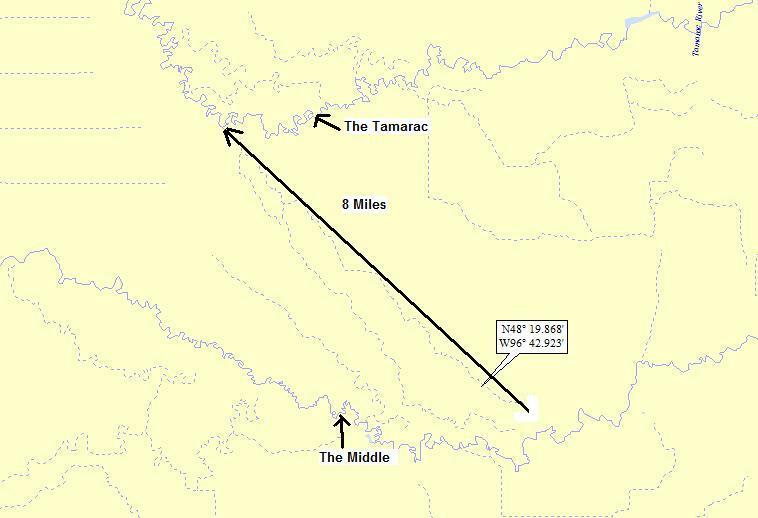 It is utterly remarkable that a drop of rain that falls so close to the Middle River has to wend its way instead to the Tamarac, located 8 miles away!! 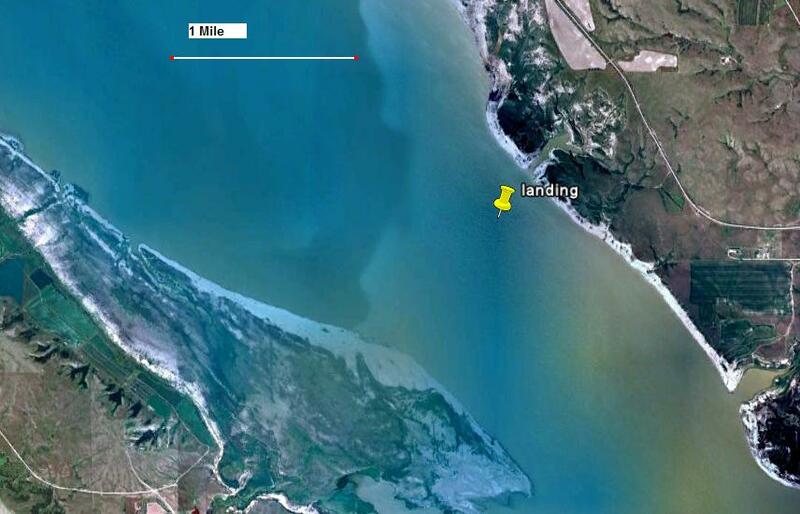 At one time, this entire northwest corner of the state was covered by a vast freshwater lake. 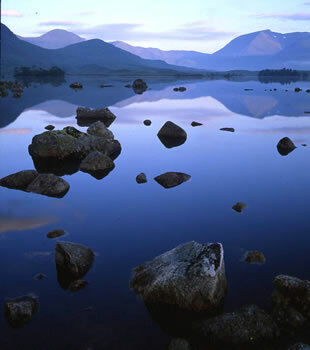 Although the area was left fairly level by glacial activity before the lake formed, the lake is responsible for the large level areas found here. Over the centuries as the lake level dropped, large beach ridges were formed as new shoreline was exposed and carved out by the action of the waves. 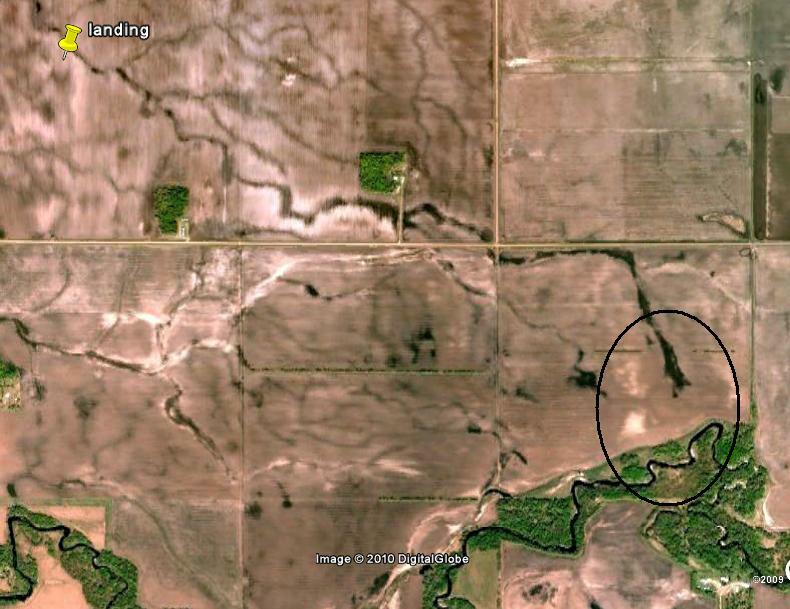 The Middle River valley was cut by the river flowing over the loose sediment left behind by the lake. 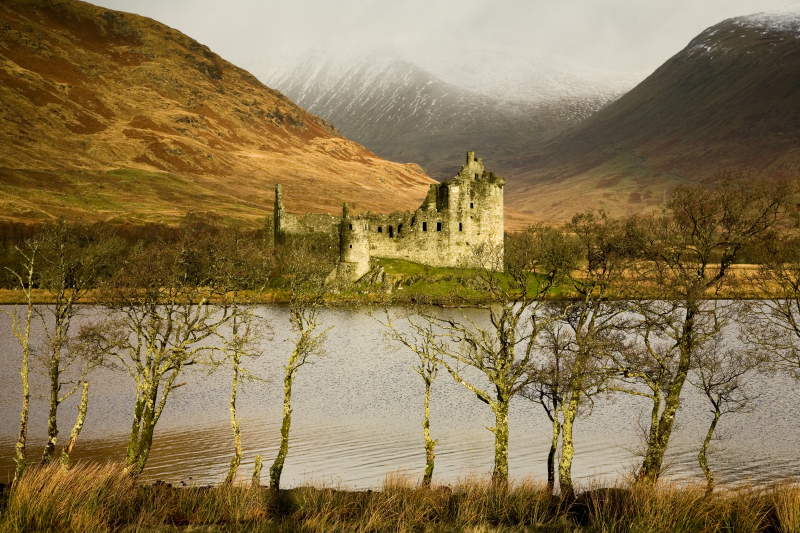 Each time the lake level dropped, the river would cut a deeper channel. The steep-walled valley and narrow flood plain are typical of a young river valley. So anyway, my guess is that the Middle River near my landing flows parallel and adjacent to one of these old beach ridges. 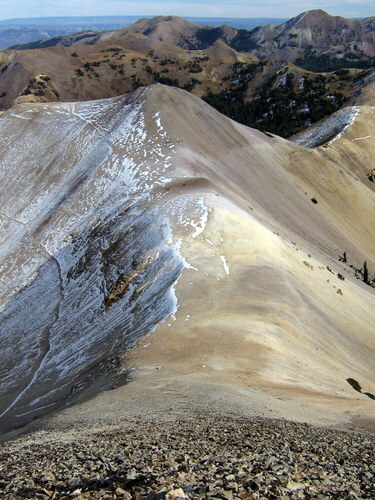 This old beach ridge acts as a drainage divide – everything north of the ridge (i.e., my landing) drains north . . .
Moving on to Argyle: Surprise!! Argyle was founded in the late 1800s when the railroads came through (along with thousands of other towns . . .). 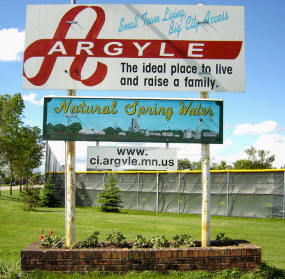 The railroad decided that the town be named Argyle, for no obvious reason. 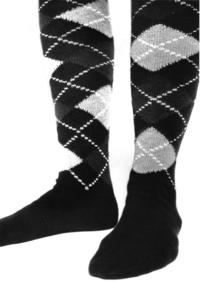 Likely, it’s named for Argyle (or Argyll) Scotland, which is the home of the Argyle pattern (of socks fame). 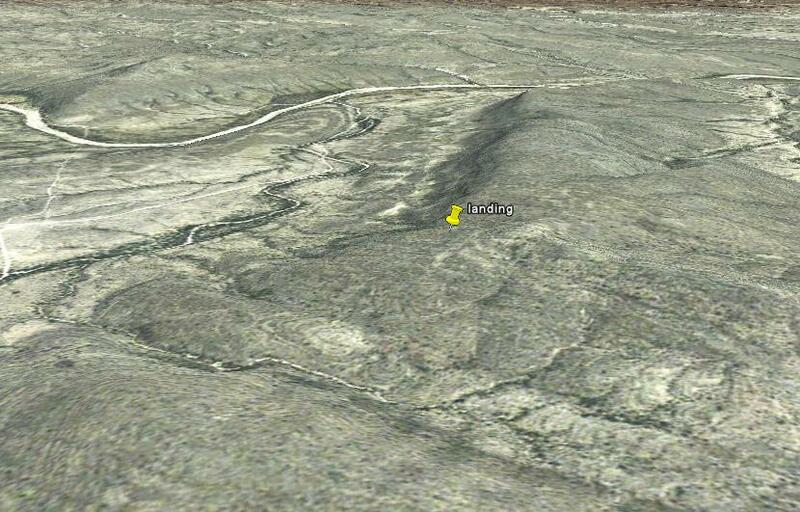 It turns out that the more northeasterly landing that you can see above is an ALAD landing (my Stanley ND post). 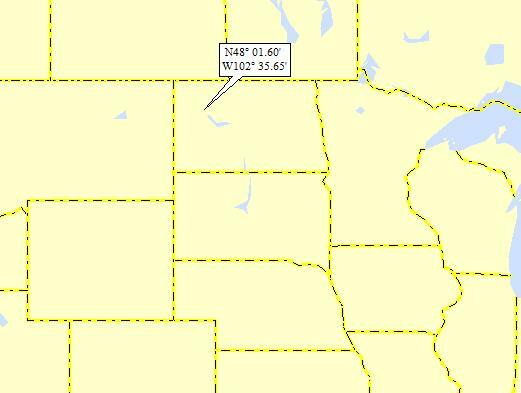 And, son of a gun if I didn’t feature New Town as well as Lake Sakakawea, which is the Missouri River Lake where I landed today! So, even though I landed in the Lake and landed closer to New Town than before, both are out of the running for me to feature in this post. Here’s another GE Street View shot from the bridge over the Missouri (Rt 23; see my landing map). We’re looking north; my landing is in the distance, near the eastern shore. 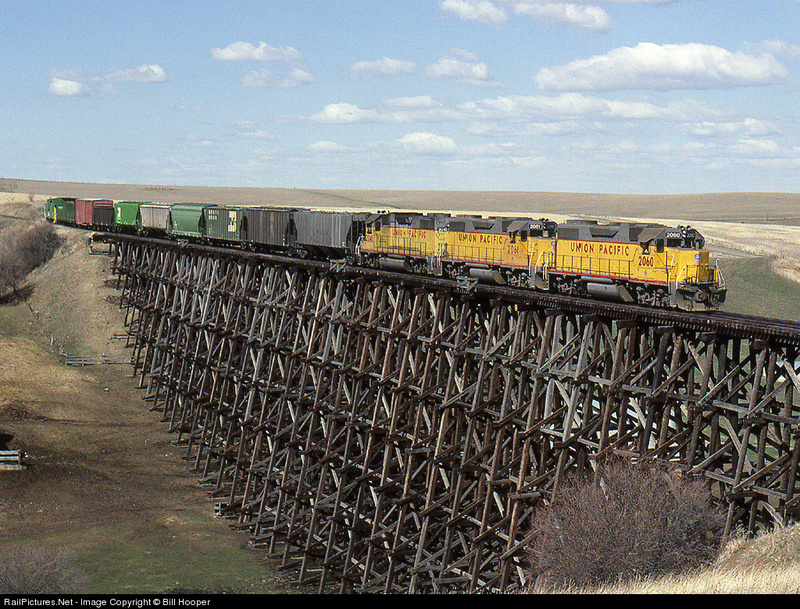 Four Bears Bridge opened in 2005 and is the second largest bridge in North Dakota. 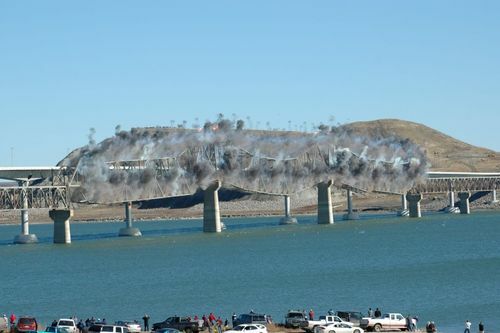 It replaces an earlier bridge built in 1955. 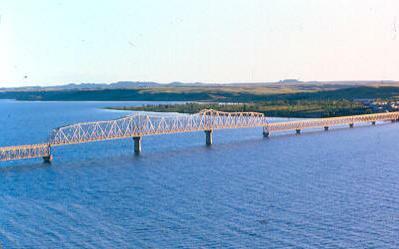 The 1955 bridge replaces an even earlier bridge known as the Verendrye Bridge after the first European explorer to visit present day North Dakota. The bridge is decorated with medallions reflecting the heritage of the Three Affiliated Tribes, the Mandan, Arikara and Hidatsa who inhabit the area. 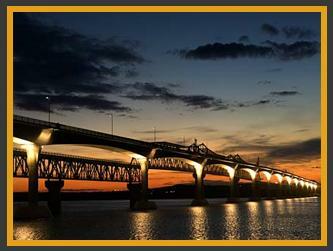 The bridge is named for two chiefs (one Mandan and one Hidatsa) who were both named Four Bears. 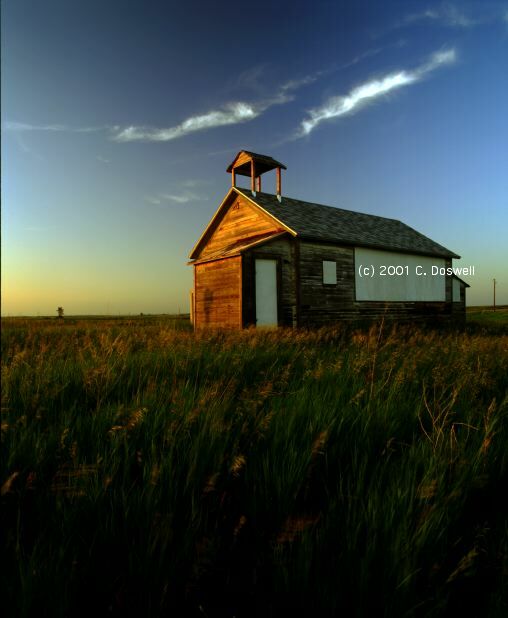 Mandaree ND, with a population of 558 in the 2000 census, is located on the Fort Berthold Indian Reservation in the Mandan, Hidatsa and Arikara Nation. It is the home to current tribal chairman Tex Hall as well as being the primary physical center of the Mandan-Hidatsa community. It is noted nationally for its annual Pow-Wow as well as being the home of the Mandaree Singers, a world renowned tribal musical group. 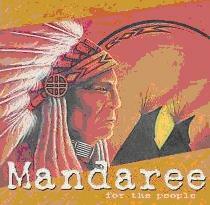 The Mandaree Singers have been instrumental in preserving Native American musical traditions. With their call and response vocals set to the rhythmic pulse of drums and rattles, the group has been thrilling audiences at powwows and concerts for nearly four decades. 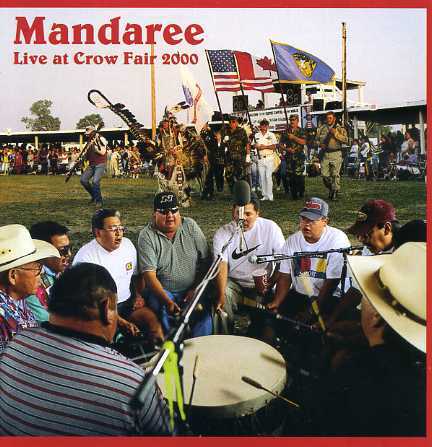 Comprised of members of the Manna, Hidatsa, and Airbrake, the Mandaree Singers are based on the Fort Berthed Reservation in North Dakota. The group came together in the 1950s as the Black Lodge Singers. Wow – this is genuine Indian music (i.e., these guys make no attempt to appeal to mainstream American musical tastes). Click here for a performance on YouTube. 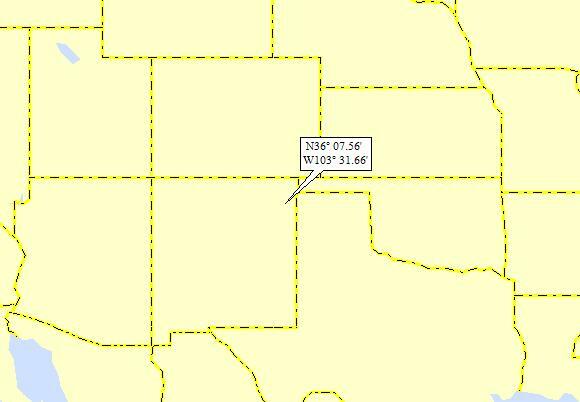 It’s a little vague, but you can make out that the Arkansas watershed extends into northeastern NM. 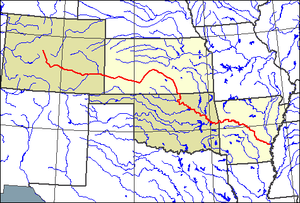 The Canadian is the river that flows south through NE NM, then turns east and flows across the TX panhandle into Central OK, where it hooks up with the Arkansas. Thomas Edward Ketchum was born in Texas in 1863. Tom and his older brother Sam were both cow boys working on ranches throughout west Texas and northern and eastern New Mexico. 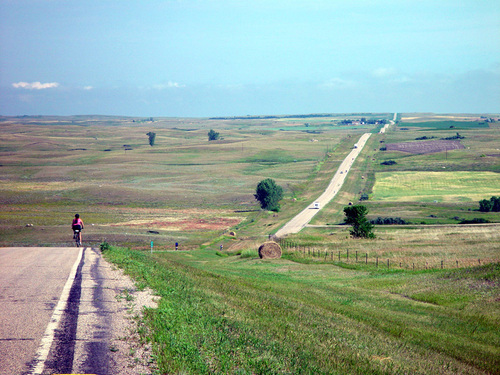 They were in many trail drives and got to know the territory, settlers and ranchers very well. Tom’s first major crime was the murder of John N. “Jap” Powers, a Texas neighbor of Tom’s. Powers was shot down in December 1895, by several men including Black Jack. Tom later admitted that he took part in the murder, but was paid to do it. Later he left , and his brother Sam joined him later in New Mexico. In June of 1896, the brothers were working at a ranch in New Mexico, when they quit their jobs and stole some supplies. 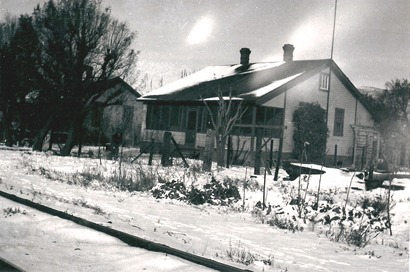 They came to the small settlement of Liberty, north of present-day Tucumcari, where there was a store and post office operated by Levi and Morris Herztein. 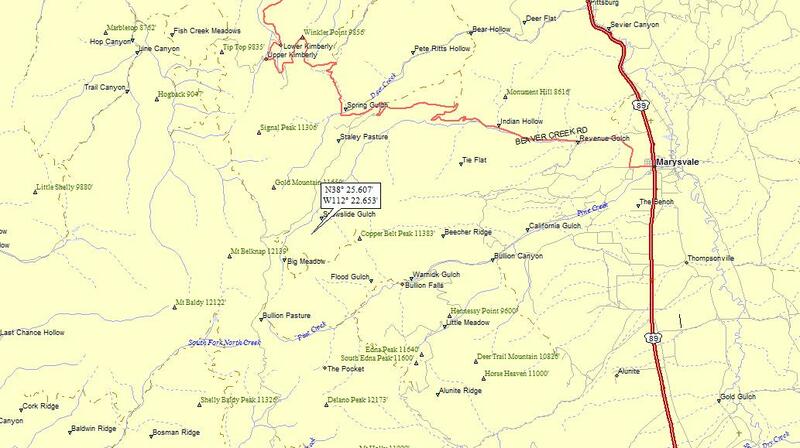 Tom and Sam robbed the store at night and then rode to the Pecos River. Levi and some 3 or 4 men went after the Ketchums and after a short gun battle most of the posse formed by Levi were dead. After the Herztein killings, Tom and Sam joined friends in Arizona and went on a killing and robbery spree in the Four Corners states, where some of the time they rode with members of Butch Cassidy’s Hole in the Wall Gang. On of the Gang was Will Christian, who was known as “Black Jack.” When he was killed in 1879 someone mistakenly identified Thomas as “Black Jack.” The name stuck. Tom & Sam split off from the Hole in the Wall Gang, and formed what was known as the Ketchum Gang. After many train robberies, a posse of law men hunted down the Ketchum gang. After a short gun battle at Turkey Creek, the outlaws escaped, but Sam was wounded so badly he was taken to a hospital and was turned in by a nurse. He later died of his wounds in the Santa Fe penitentiary and was buried in the Odd Fellows cemetery which is now covered by a road. Later, Black Jack was trying to hold up a train by himself, but the conductor shot his left arm and Tom staggered off into the night. He was found at a water hole and surrendered peacefully, and was taken to a hospital in Santa Fe where he had his arm amputated. 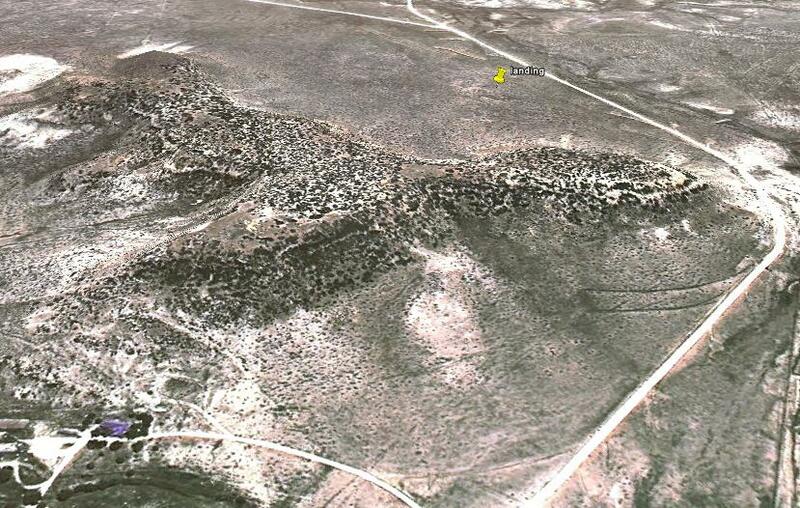 When his arm healed he was taken to Clayton, NM for his trial. He pled innocent to most of the crimes he was charged with but, the judge found him guilty and he was sentenced to death by hanging. 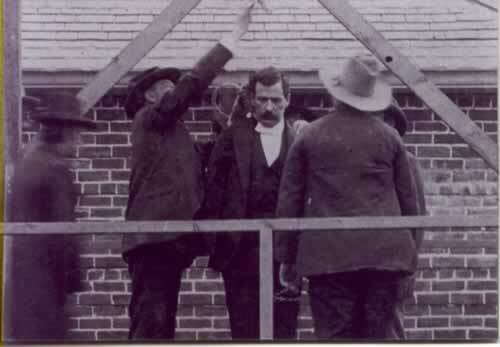 The hanging was delayed several times until law men heard about rumors that old gang members were going to free Black Jack, so they pushed up his hanging to April 26 1901. His hanging turned out to be a big town event. People from the towns around Clayton came; the town sold tickets to see Black Jack get hung and they even sold little dolls of Black Jack hanging on a stick. The law men felt better about pushing up his sentence, but were still a little nervous about the rumors about somebody saving Black Jack. At the hanging, a tall stranger was noticed . . .he and Black Jack exchanged several glances, but the stranger left before any one could find out who he was. The sheriff had a hatchet to cut the rope and hang ol’ Black Jack. It took two blows, but the rope was cut. Perhaps because this was Clayton’s first hanging (and they didn’t really know how to do it properly), Black Jack fell to the ground, beheaded. Black Jack was buried at Clayton’s Boot Hill ,but was moved to the new cemetery in the 30’s. This is ALAD’s first Shakespearean reference, which gives me the opportunity to confess that my knowledge of Shakespeare is right up there with my knowledge of brain surgery . . .
You’ll note a number of small towns to the north of my landing. Why I chose “Tesnus” for the post title, you’ll find out below. 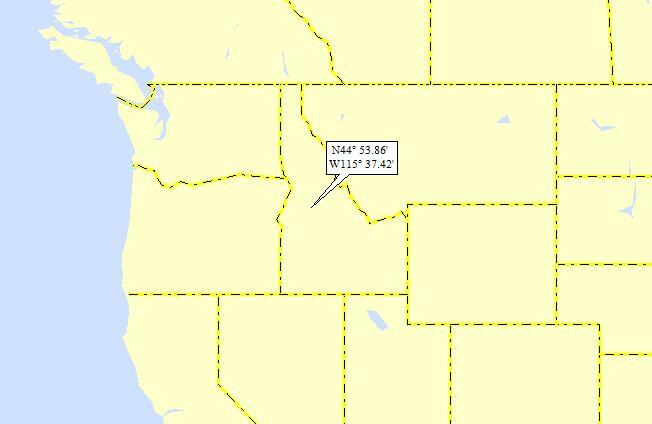 As expected, I landed in the Rio Grande watershed (35th hit). Here’s an oblique GE shot. Peculiarly, it seems as though this is a black-and-white picture. Not that far to the east and to the west, the photos are in color. Oh, well. The Italian Greyhound is the smallest of the family of gaze hounds (dogs that hunt by sight). The breed is an old one and is believed to have originated more than 4,000 years ago in the countries now known as Greece and Turkey. 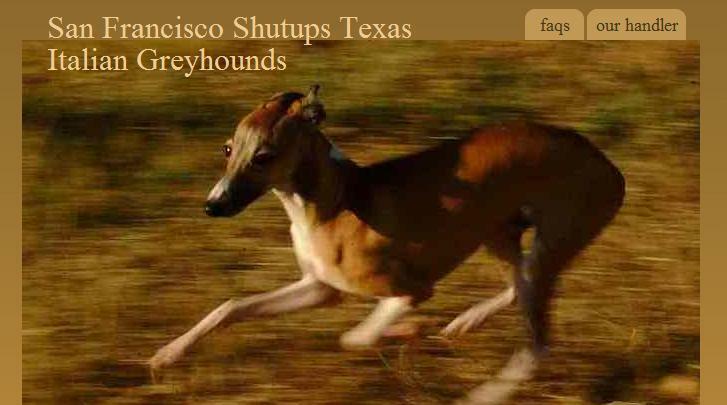 This belief is based on the depiction of miniature greyhounds in the early decorative arts of these countries and on the archaeological discovery of small greyhound skeletons. Mummy dogs very similar to the Italian Greyhound (or small Greyhounds) have been found in Egypt, and pictorials of small Greyhounds have been found in Pompeii. By the Middle Ages, the breed had become distributed throughout Southern Europe and was later a favorite of the Italians of the sixteenth century, among whom miniature dogs were in great demand. It is, in fact, due to its popularity in Italy at this time that the breed became known as the “Italian Greyhound.” From this period onward the history of the breed can be fairly well traced as it spread through Europe, arriving in England in the seventeenth century. If you want a genuine Italian Greyhound, now you know where you can find one. 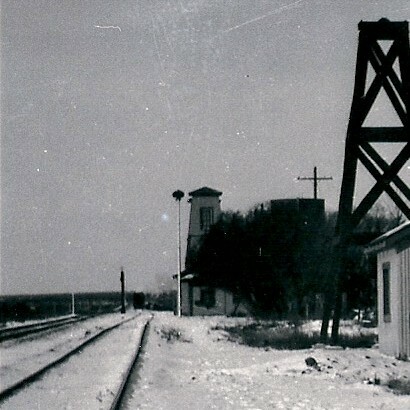 First called Tabor, the railroad enclave lost that name when a post office application got rejected by Washington because a similarly named town already existed in Brazos County. Then Sunset arose as a fitting name for the place, considering the famed Sunset Limited passenger train came through each day. 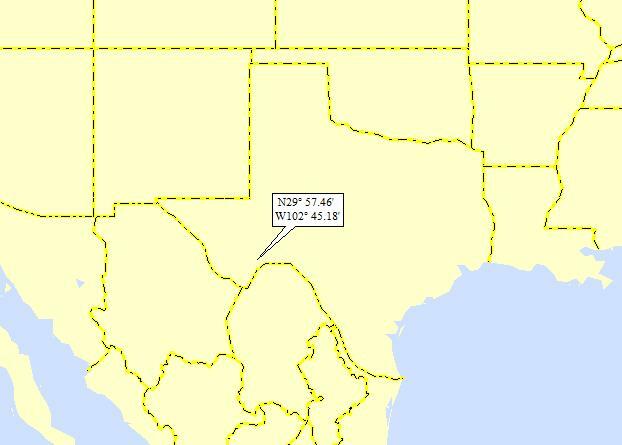 But nope, Montague County had a monopoly on Sunset, Texas. Someone finally came up with a solution to the name problem that met the approval of the Postal Service, but more of that in a bit. The addition of this new family pushed Tesnus’ population up to about 20 people. Throw in the folks who lived on the surrounding ranch and the postmistress had a small, but consistent volume of mail to handle. “Patrons came up the steps to the front porch and she served [them] through her bedroom window,” remembers one of the signal maintainer’s children. 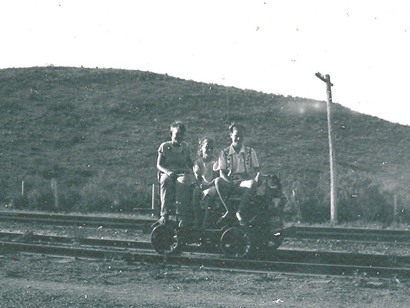 Despite the occasional influx of additional railroad workers, not much ever happened in Tesnus. The most sensational crime was when the assistant telegraph operator went on a toot and shot up the Tesnus sign. Occasionally, a railroad bull (detective) or train crewman would throw a hobo off a train, leaving him temporarily stranded there. “Mama would feed them in return for chopping kindling,” the former resident says. One time a skunk did get in the chicken coop. When a train hit a deer and word reached town in time for the meat to still be fresh, her brothers went to the spot, field dressed it and cut it up for venison on the family table. Classic big brothers, they once barbequed a rattlesnake steak and tried to talk their little sister into eating it. While she didn’t fall for that, the brothers did serve her older sister grilled mockingbird one time, telling her it was dove. Proving again the power of simplicity, to use railroad metaphor, someone suggested switching the caboose with the locomotive and spelling Sunset backwards as in T-e-s-n-u-s. 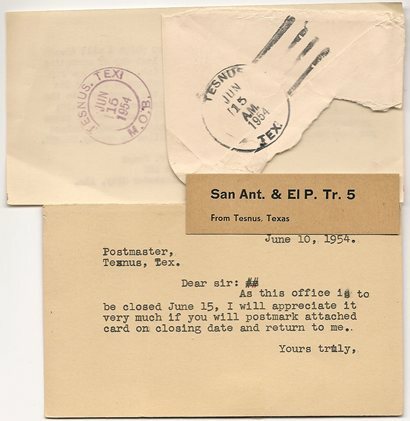 When word got out that Tesnus would be no more, the town’s last postmistress had one last flurry of business mailing out last-date-of-service cancellations to stamp collectors across the nation. 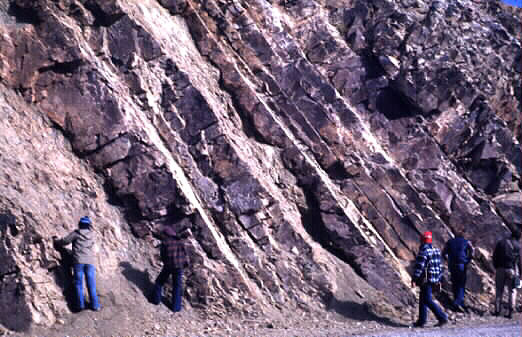 It turns out that there is a geologic bedrock formation known as the Tesnus Formation. FYI, a formation is a large-scale “mappable” bedrock unit. 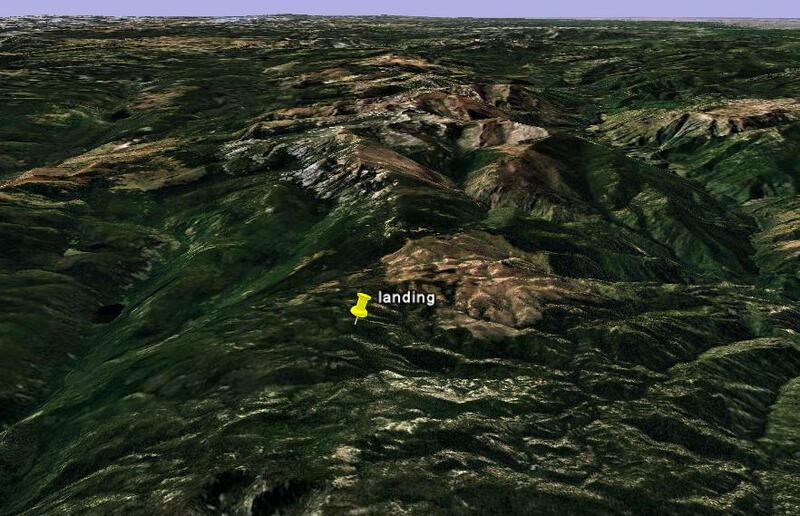 It’s generally named after a “type locale,” where there is a good exposure of the rock formation, and where the geologist(s) who named the formation did his initial fieldwork. 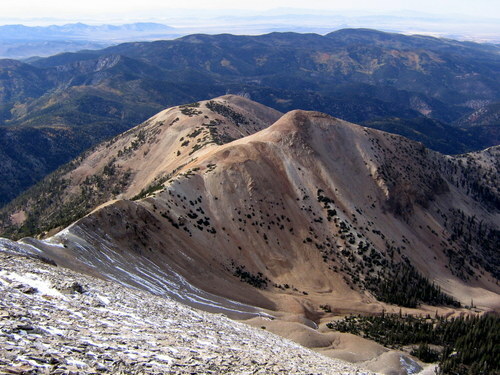 The Tesnus formation was named by Baker and Bowman for exposures near Tesnus station, on the Southern Pacific Railroad east of Haymond, in the eastern part of the Marathon Basin. The Tesnus formation is a great mass of interbedded sandstone and shale, in thin and thick beds, nearly barren of fossils except for a few plant remains in the upper part. In most places it attains a thickness of several thousand feet. 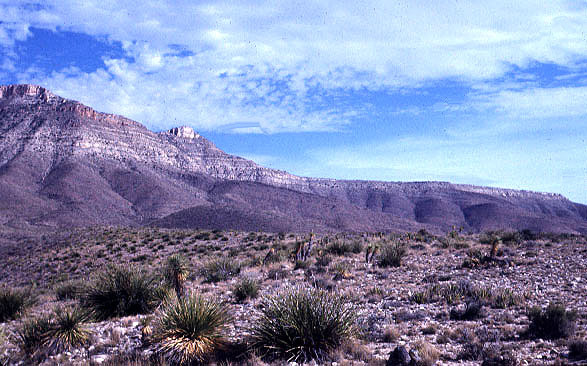 In the northwestern part of the basin it is about 300 feet thick and is nearly all black shale, with few sandstone beds. 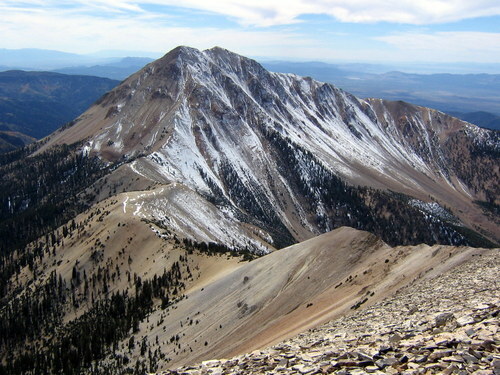 In the southeastern part it exceeds 6,500 feet in thickness and is predominantly sandstonewith several prominent massive layers of white quartzite. 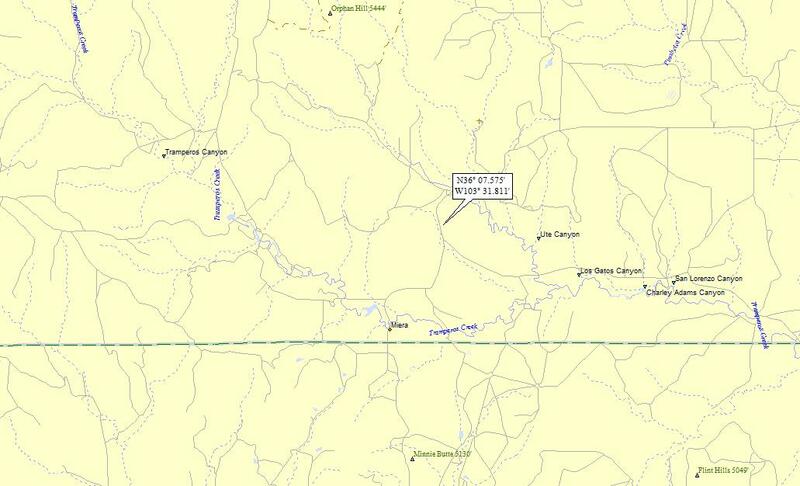 I landed in the Beaver Ck watershed (my 33rd stream name with “beaver” in it; more specifically, my 24th Beaver Ck); on to the Sevier R (9th hit), which is internally-drained. Here’s another oblique GE shot, looking west past Marysvale toward my landing. 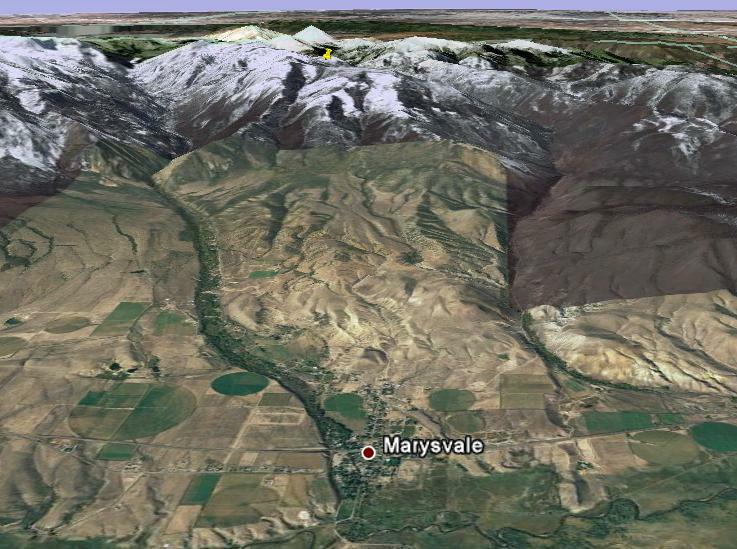 Marysvale was originally settled in 1863, later abandoned because of Indian troubles, and then resettled again. There are several claims for the name source. 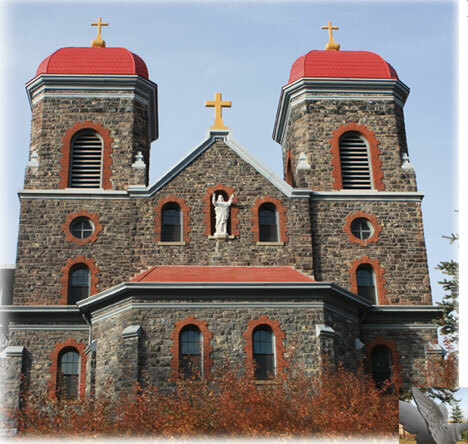 (1) It was named by a group of Catholic miners for the Virgin Mary. 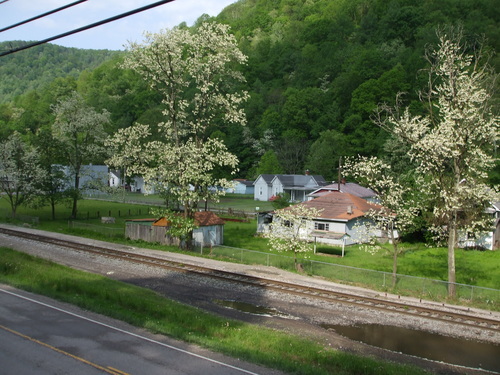 (2) Parley P. Pratt named it Merryville when he passed through in 1849 because of the beautiful surroundings. The name was supposedly later changed to Marysvale. (3) Brigham Young named the settlement for his wife Mary. 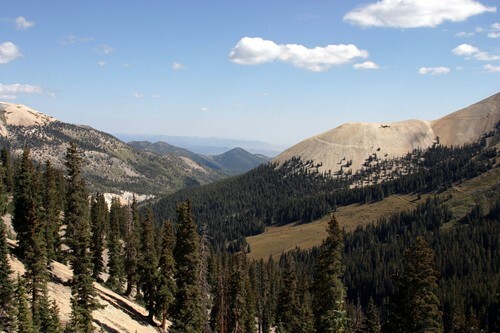 (4) The settlement was named Merry Valley or Merry Vale when Brigham Young and his party camped there when they were traveling through the area on visits to local settlements. During their visit, they enjoyed an evening of relaxation and stag dancing. Stag dancing was common during this time because men were the predominate members of traveling groups. Wow. I’m not going to touch “stag dancing” with a 10-foot pole . . .
Three out of four of the above have to do with Mormons (P. P. Pratt was a rather well-known Mormon who, it turns out, was murdered by the ex-husband of one of his wives . . .) Anyway, given the Utah Mormon connection, I doubt that the “Virgin Mary” explanation has much traction . 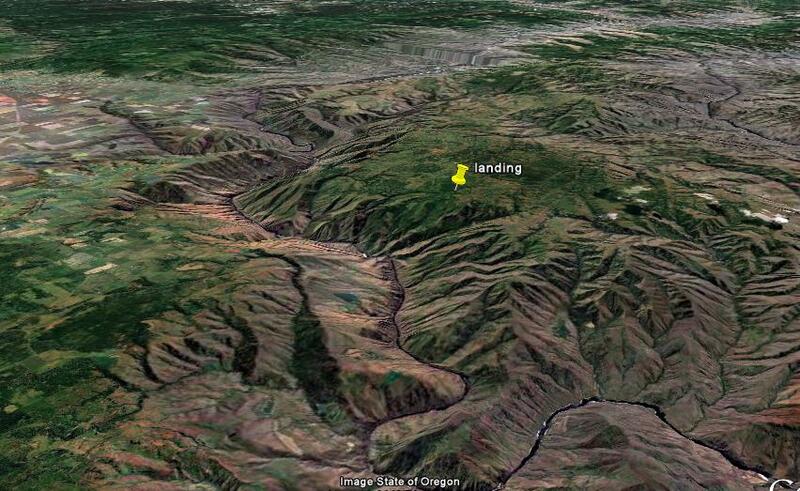 . .
Dan – I landed up in the hills a ways south of the state capital of . . . WV; 17/15; 4/10; 1; 152.5. My first reaction to WV is that it is a USer (although, as you can see, it’s not). 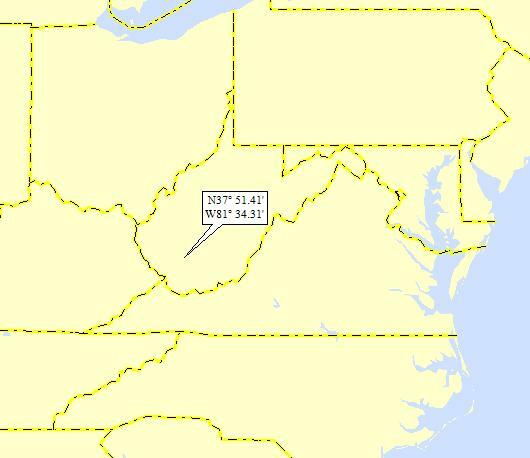 It all stems from the fact that it wasn’t until landing 496 that I first landed in WV. So, for a long time, it was definitely US. 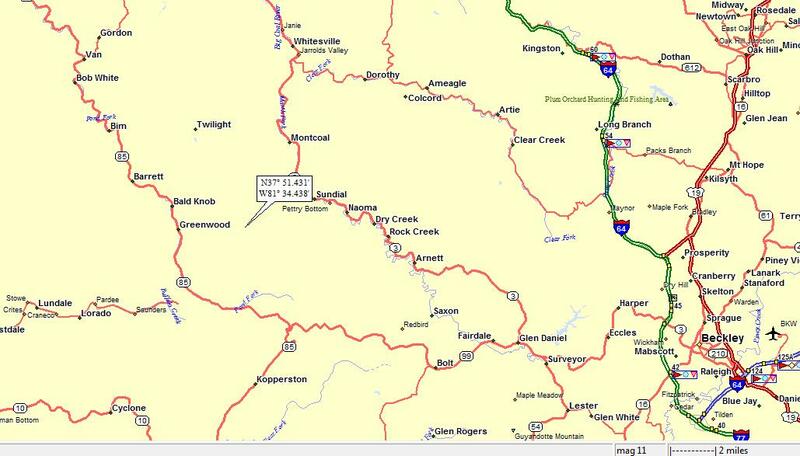 However, over the last three or so years, I’ve landed in WV enough to make it a fairly solid OSer. Oh, well . 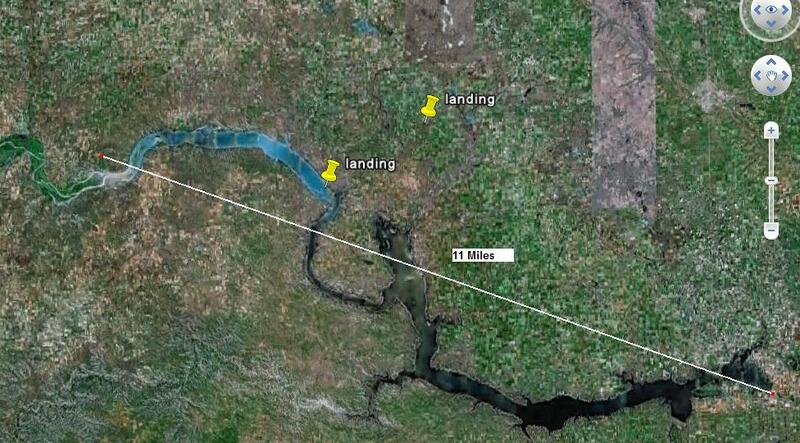 . .
Here’s my landing map, showing that I landed amongst a plethora of incredibly small towns. 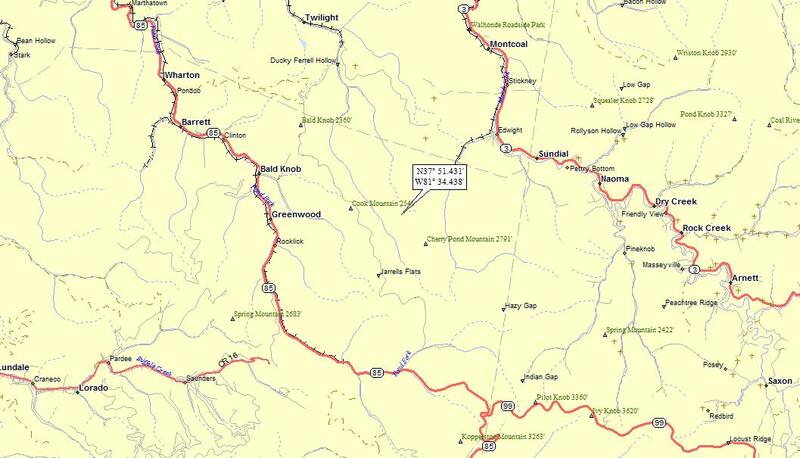 I landed in the Coal Ck watershed, on to the Cabin Ck, on to the Kanawha R (10th hit); to the Ohio (117th hit); to the MM (728th hit). Here’s the GE shot, which annoyingly is split between what I assume is a summer photo (to the east) and a winter photo (to the west). You can see that there are few signs of civilization, except what may be some kind of coal mining operation to the west of my landing. I could find only two pieces of information about Chelyan. 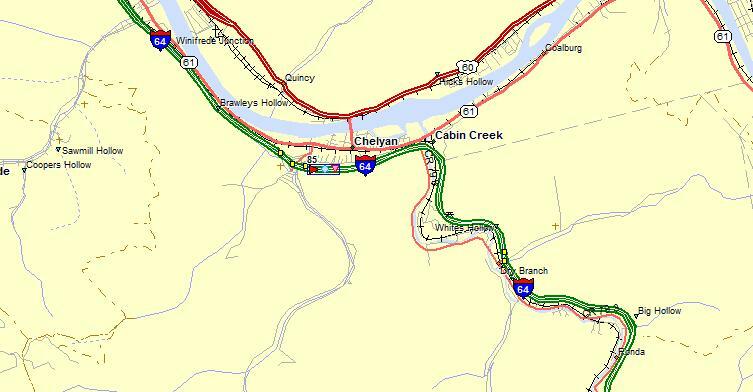 First, the town was named after Chelyan Calvert, daughter of first postmaster. 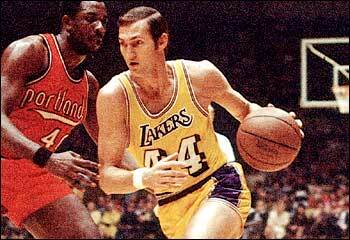 And secondly, it turns out that Jerry West, famous basketball player, was born and raised in Chelyan. 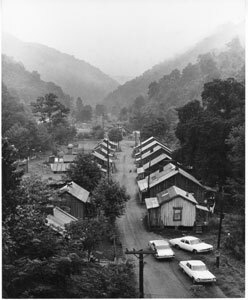 Jerry Alan West was born into a poor household in Chelyan, West Virginia. West was a shy, introverted boy, who grew up in a poor family and whose father was so drained after work that he could not play with his children. He was so small and frail that he needed vitamin injections from his doctor and was kept apart from children’s sports, to prevent him from getting seriously hurt. Growing up, his main distraction was shooting at a basketball hoop that a neighbor had nailed to his storage shed. West spent years shooting baskets from every possible angle, ignoring mud in the backyard, his mother’s lashes when he came home hours late for dinner, and playing with gloves when the ground was covered with snow. 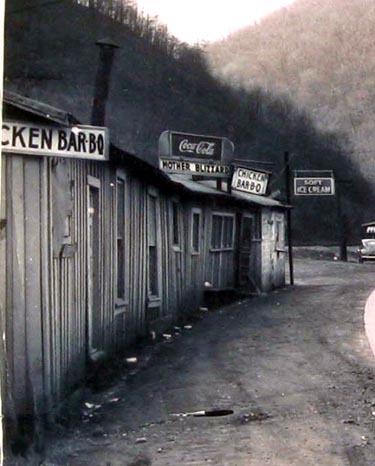 He was named All-State from 1953–56 and then All-American in 1956 when he was named West Virginia Player of the Year, becoming the state’s first high-school player to score more than 900 points in a season, averaging 32.2 points per game. West led East Bank High School to a state championship on March 24 of 1956, prompting East Bank High School to change its name to “West Bank High School” every year on March 24 in honor of their basketball prodigy. As a rookie pro with the LA Lakers, West felt odd in his new environment. He was a loner. His high-pitched voice earned him the nickname “Tweety Bird”, and he spoke with such a thick Appalachian accent that his teammates also referred to him as “Zeke from Cabin Creek” (his nickname acknowledged his country roots, and his accent was so thick that he squeaked his nickname sheepishly – “Zeek fr’m Cab’n Creek”). Combine a deadly jump shot, tenacious defense, obsessive perfectionism, unabashed confidence, and an uncompromising will to win, and you’ve got Jerry West, one of the greatest guards in NBA history. During his 14-year playing career with the L.A. Lakers, West became synonymous with brilliant basketball. He was the third player in league history to reach 25,000 points (after Wilt Chamberlain and Oscar Robertson). He was an All-Star every year of his career and led Los Angeles to the NBA Finals nine times. 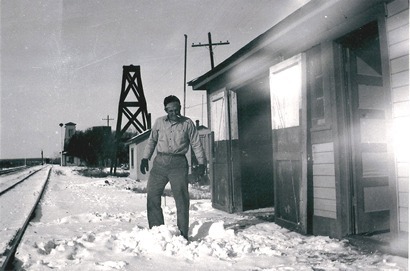 In 1911, miners at Paint Creek and Cabin Creek went on strike, often coming close to violence against the mine companies’ armed guards and scabs. Most of the scabs were unwitting accomplices in the business of ending the strike–they came from distant places, were usually hired without being aware of the strike, and forced to continue working if they did not like the situation when they arrived. The mine operators refused to negotiate with the union, and relied on violence to keep their workers in line. Machine guns defended the company offices, and the mine guards were ordered to shoot, and even to kill. Due to the isolation of the mines, the operators were able to escalate violence and intimidate workers without the risk of public uproar. 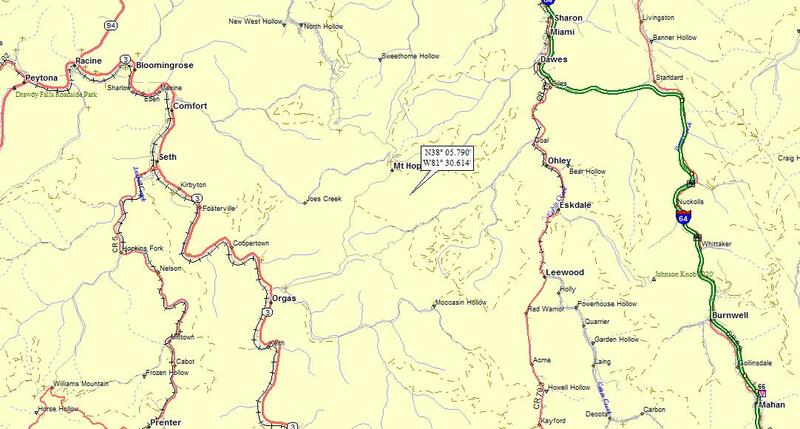 Even though Cabin Creek was isolated, Mother Jones found a way to reach the workers. 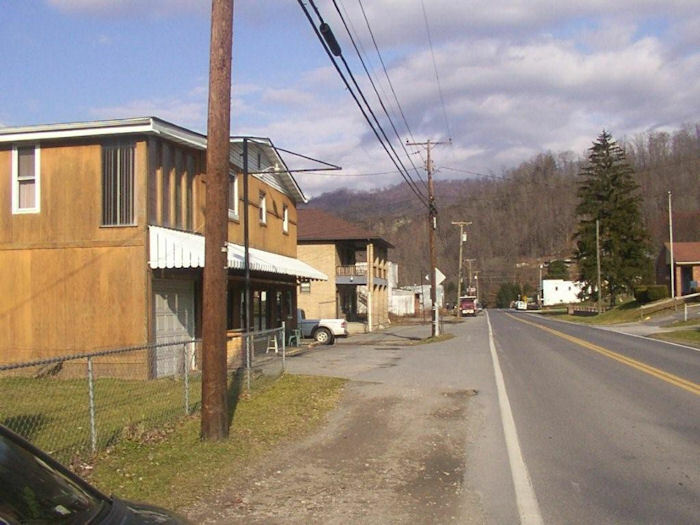 One town in the Cabin Creek district, Eskdale, had been incorporated before the mine companies came to West Virginia. Therefore, it was a “free town” where coal companies did not have the authority to prevent meetings from taking place or to harass people. 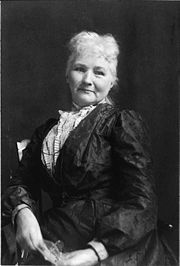 Mother Jones went to Eskdale and called an organizing meeting of the UMW in August of 1912. Her rhetoric aroused the workers to strike, and her persistence galvanized both the workers and their families. Typically clad in a black dress, her face framed by a lace collar and black hat, the barely five-foot tall Mother Jones was a fearless fighter for workers’ rights—once labeled “the most dangerous woman in America” by a U.S. district attorney. Mary Harris “Mother” Jones rose to prominence as a fiery orator and fearless organizer for the Mine Workers during the first two decades of the 20th century. Her voice had great carrying power. Her energy and passion inspired men half her age into action and compelled their wives and daughters to join in the struggle. If that didn’t work, she would embarrass men to action. “I have been in jail more than once and I expect to go again. If you are too cowardly to fight, I will fight,” she told them.